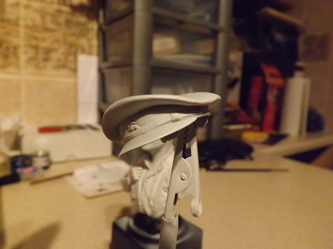 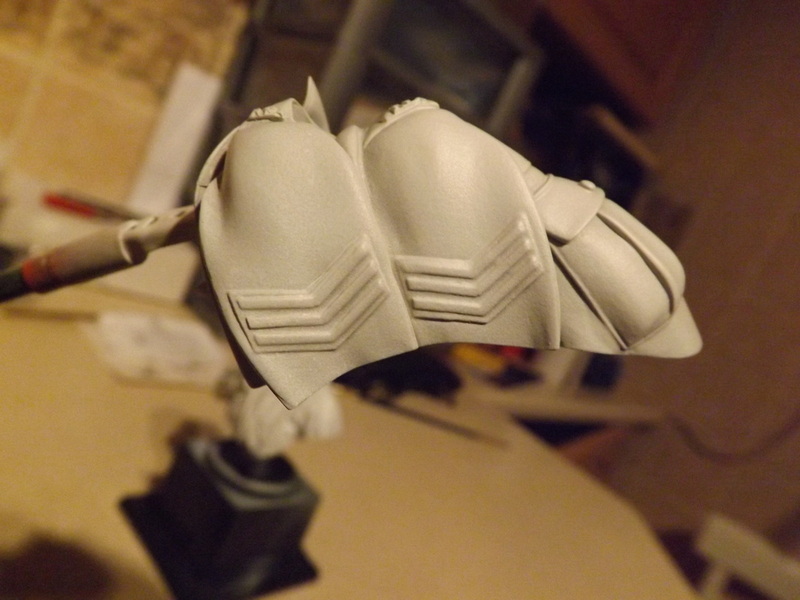 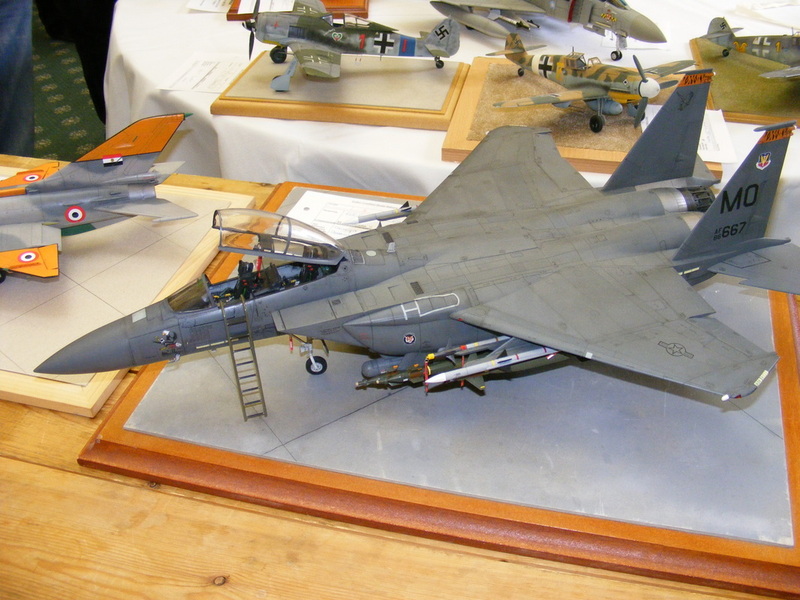 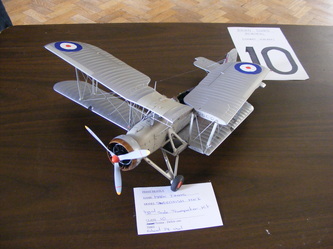 New set of photographs from John Turner of his latest figure build. 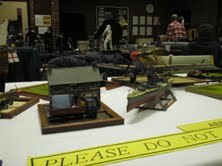 Nice pictures JT, thanks for sharing them with us. 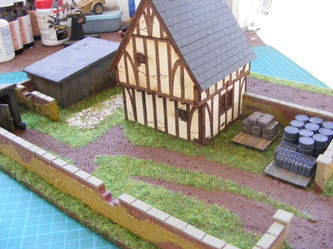 Another set of pictures sent to me by John, of a couple of project he's picked up again. He tells me that these were put on the "back burner" a couple of years ago, but now he's decided to carry on with them, and try to finish them off! (maybe while the paint was drying on his Royal Marine)?? 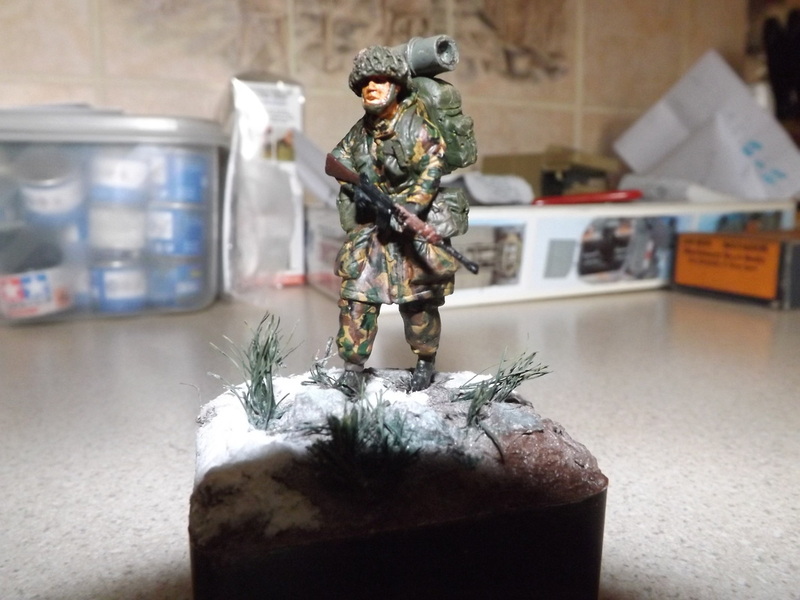 Sorry mate, couldn't resist that!! I believe the first 3 are of a Hummer Ambulance, and the rest are of a Ford Mutt. John Turner sent in these pictures of an ongoing project. 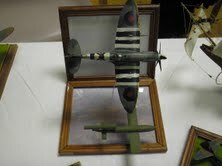 He didn't tell me the subject, but i can assure you, it's not an aircraft!! 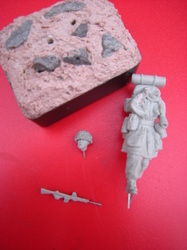 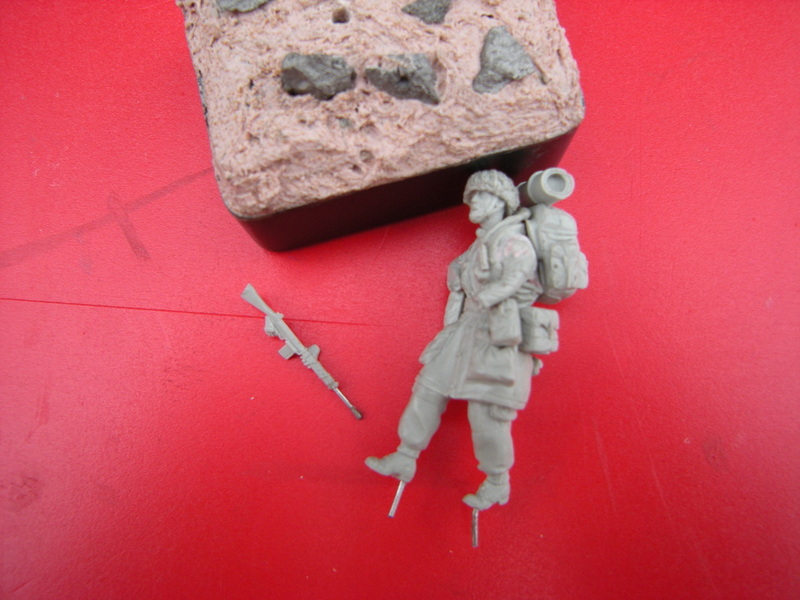 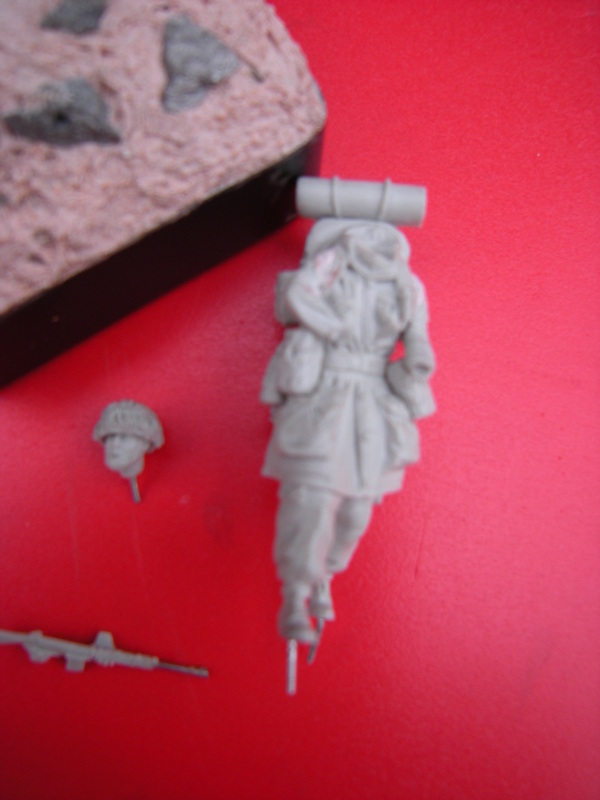 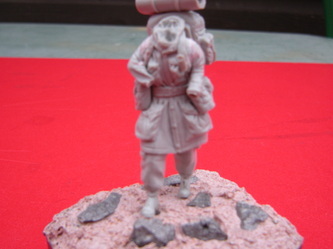 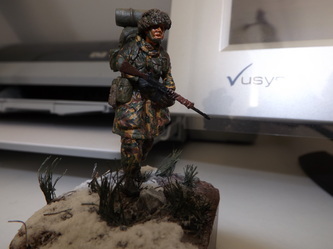 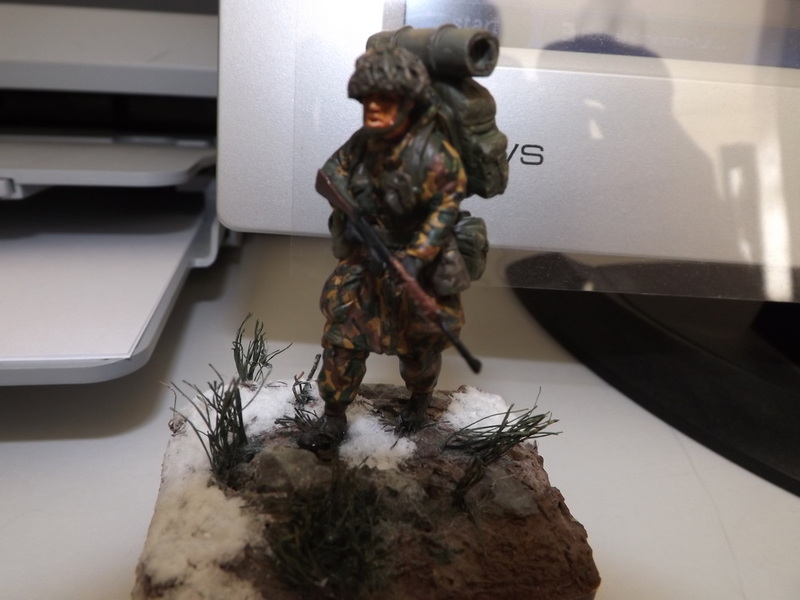 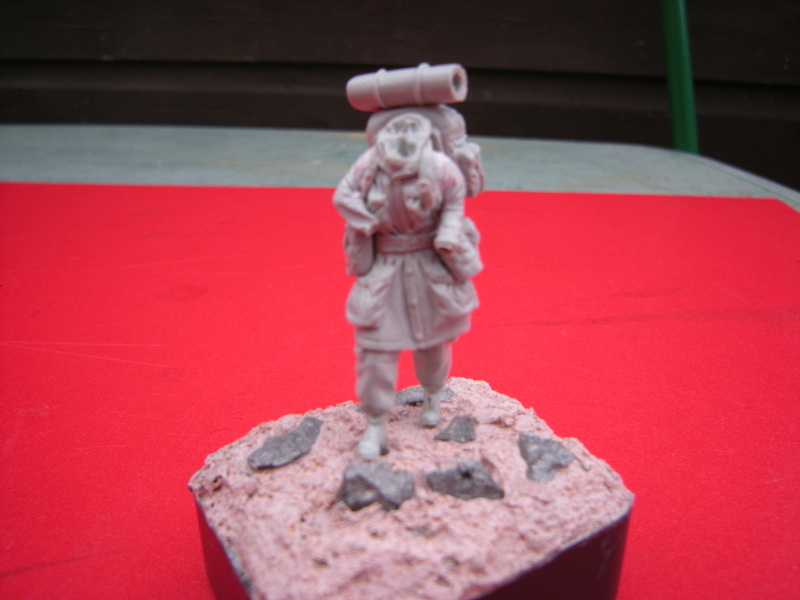 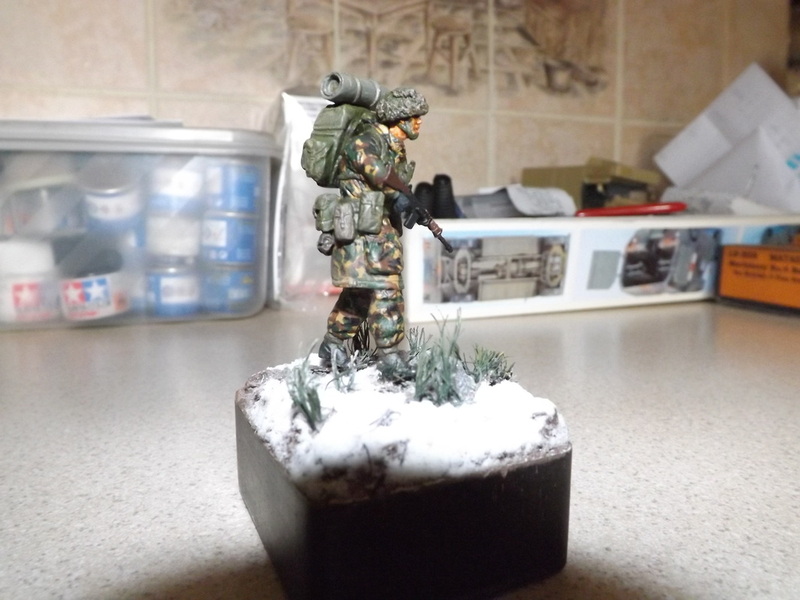 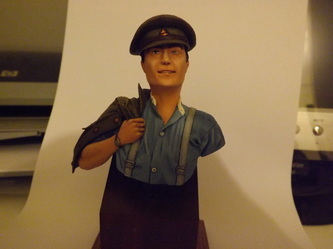 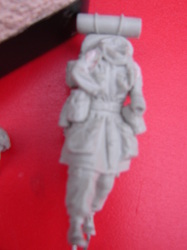 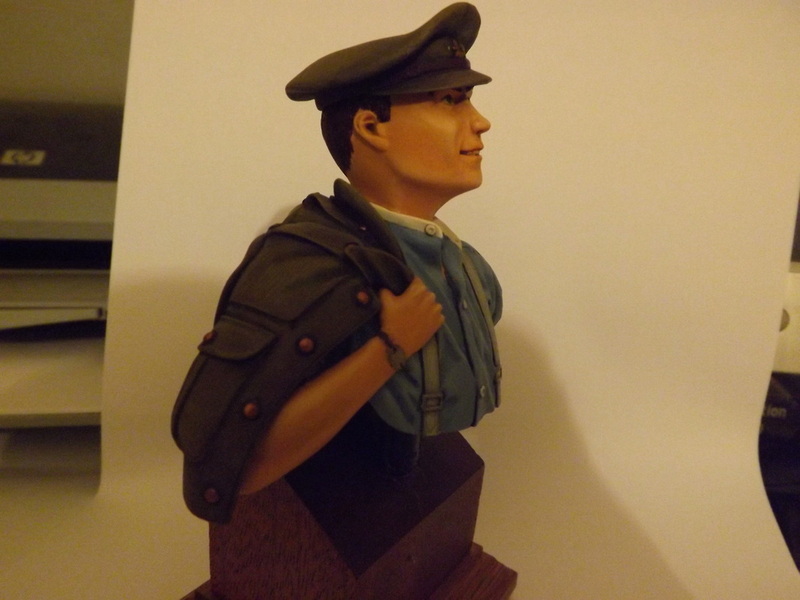 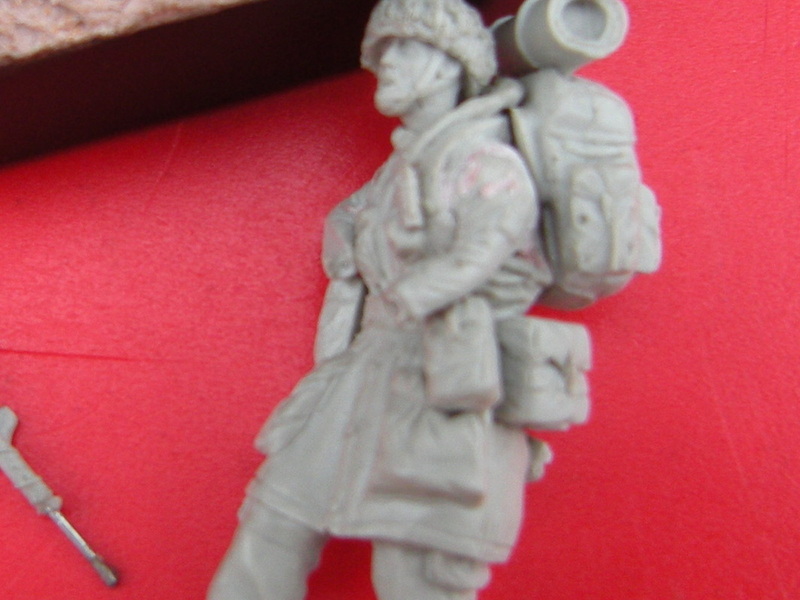 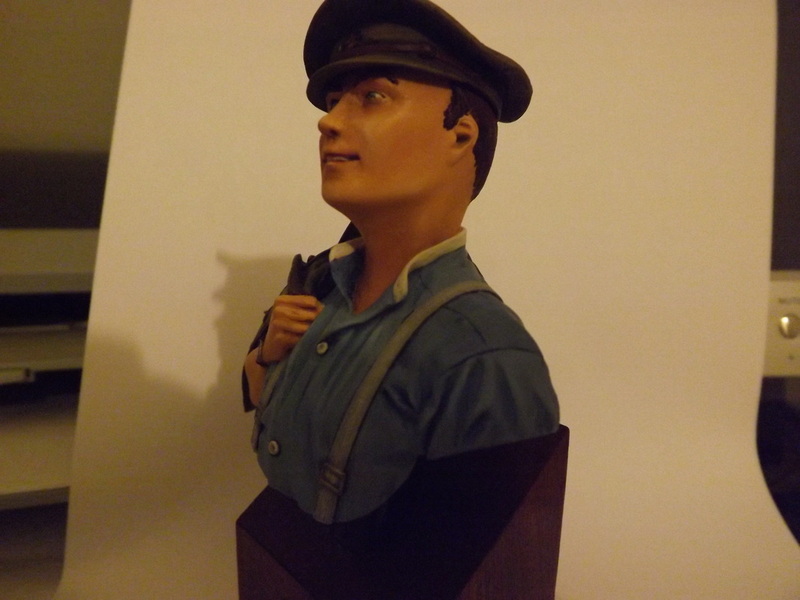 Update from John, who tells me it's a Royal Marine figure, shown in the Falklands conflict. 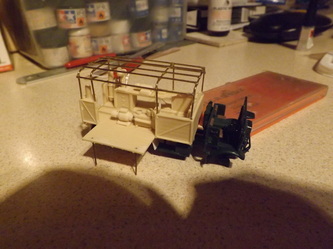 John hopes to get it finished in time for the Telford Show. 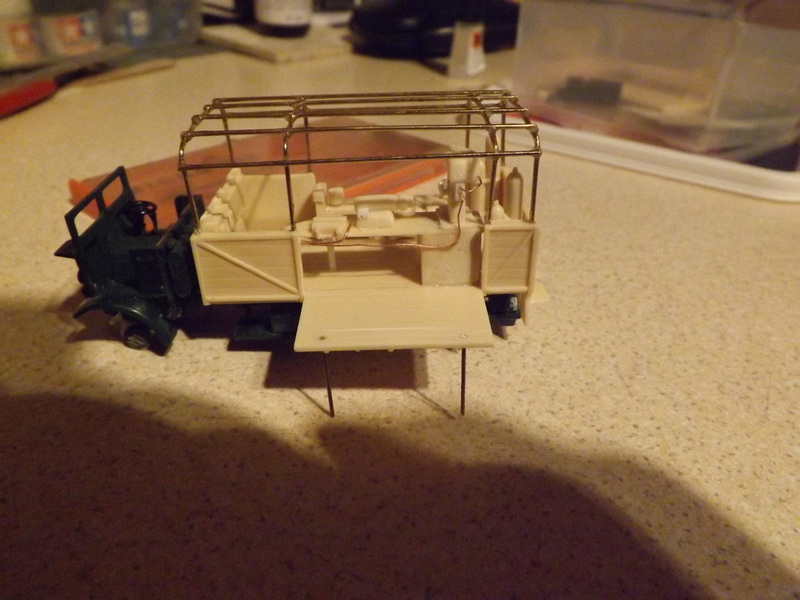 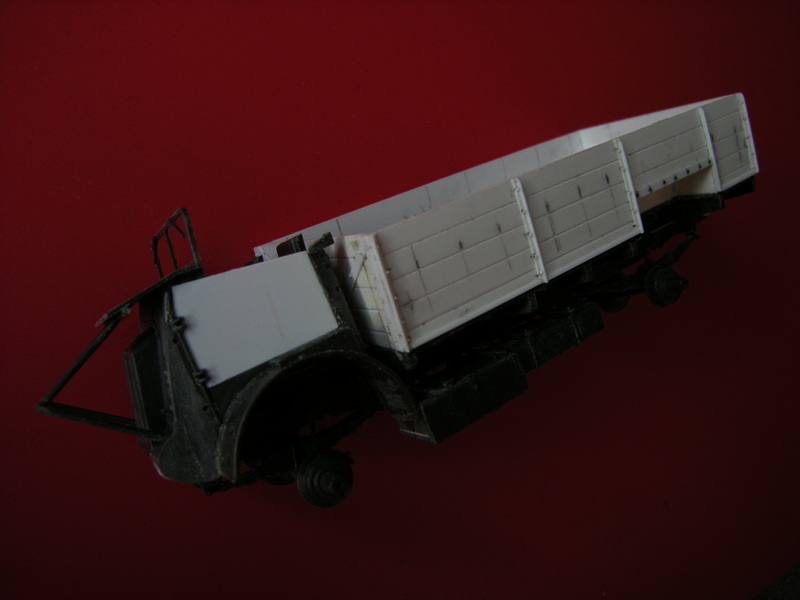 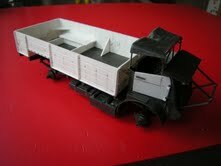 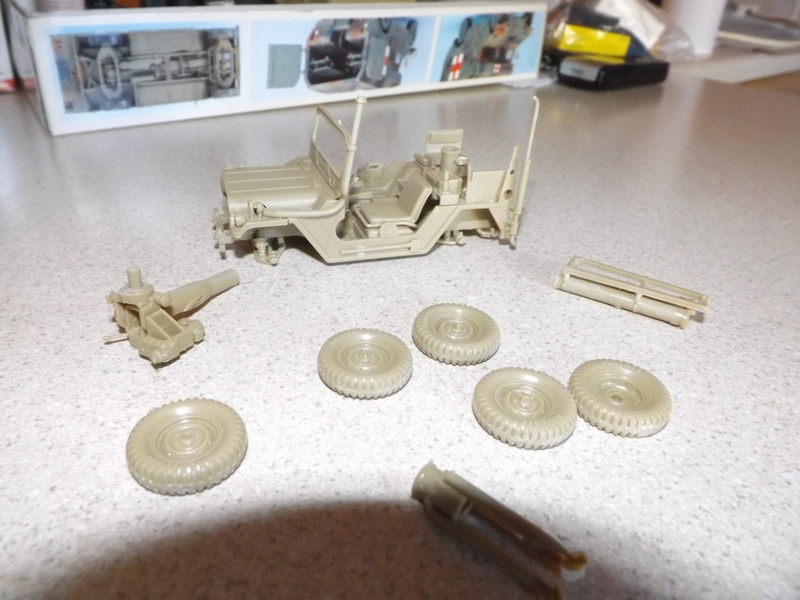 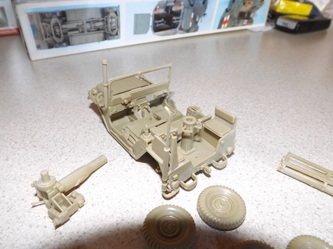 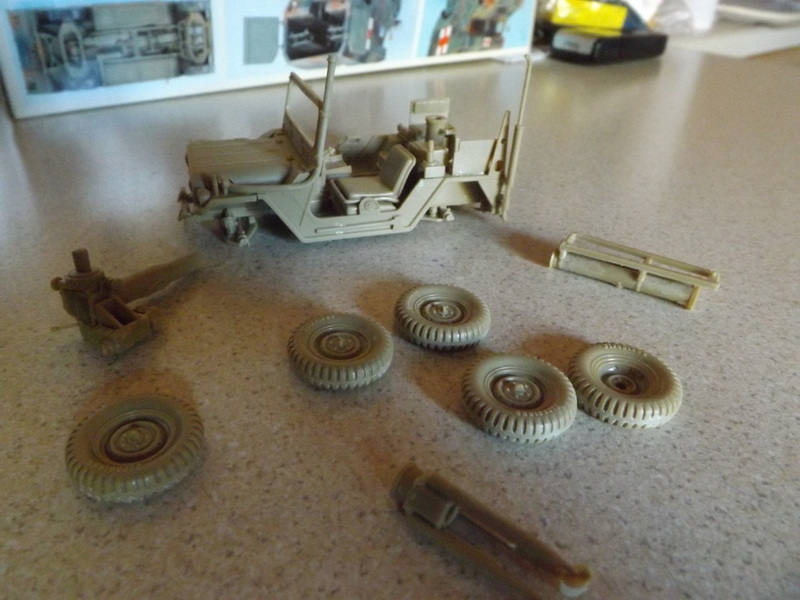 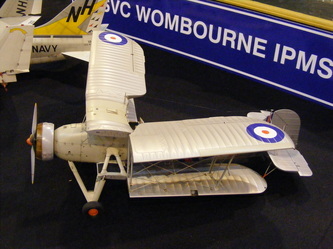 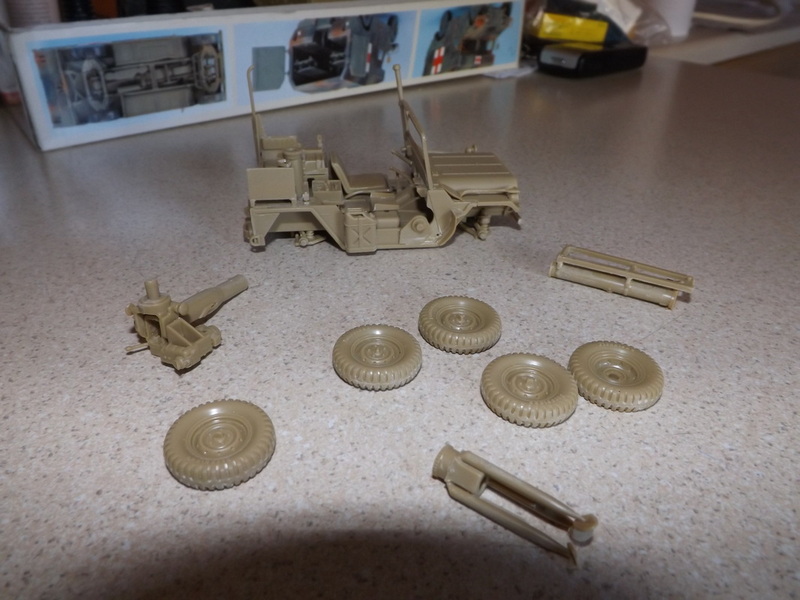 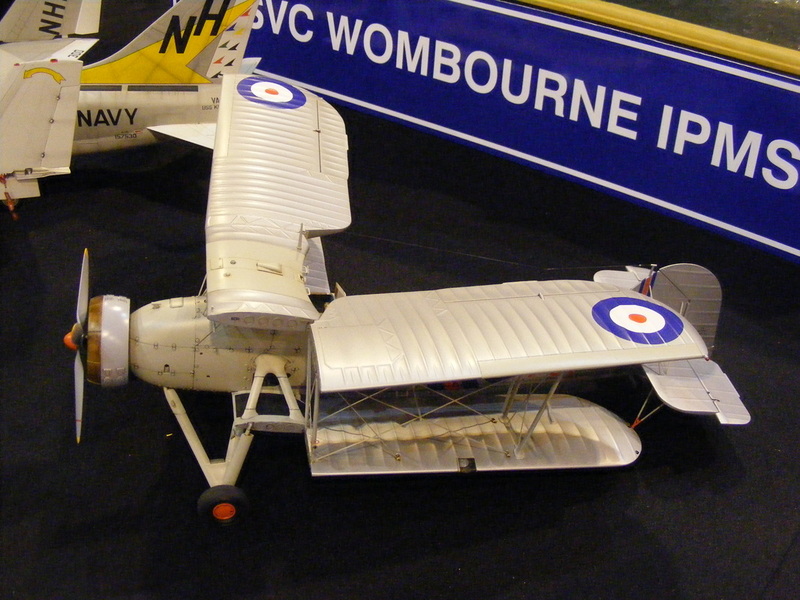 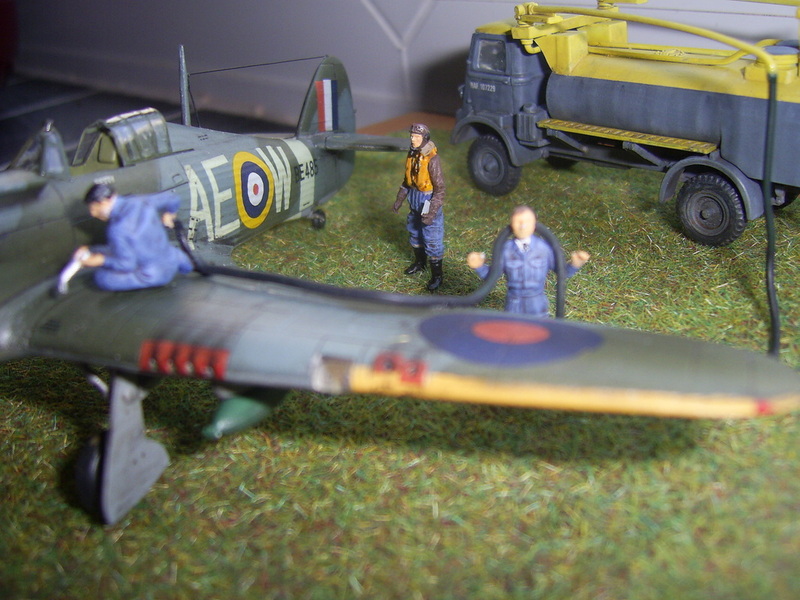 These next 5 pictures, were sent in by John Turner, and are of of a model that he currently has under construction, namely a Bedford. 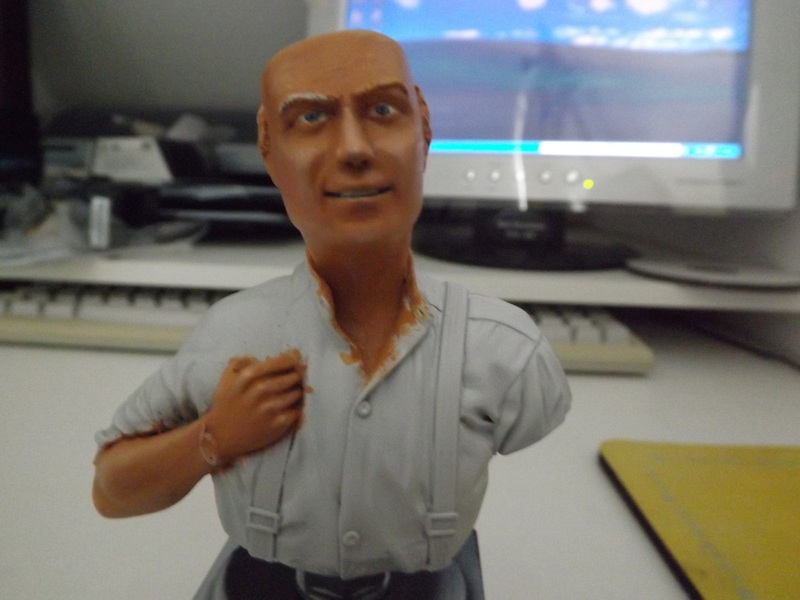 Sorry, i don't know the mark, but i'm sure he'll let us know. 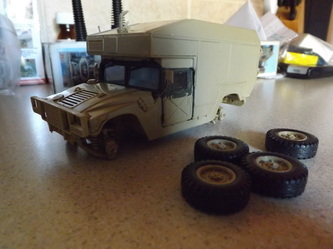 Could it be a QL conversion John??? 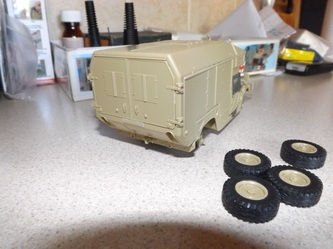 At least it's got wheels, but no wings!!!!! 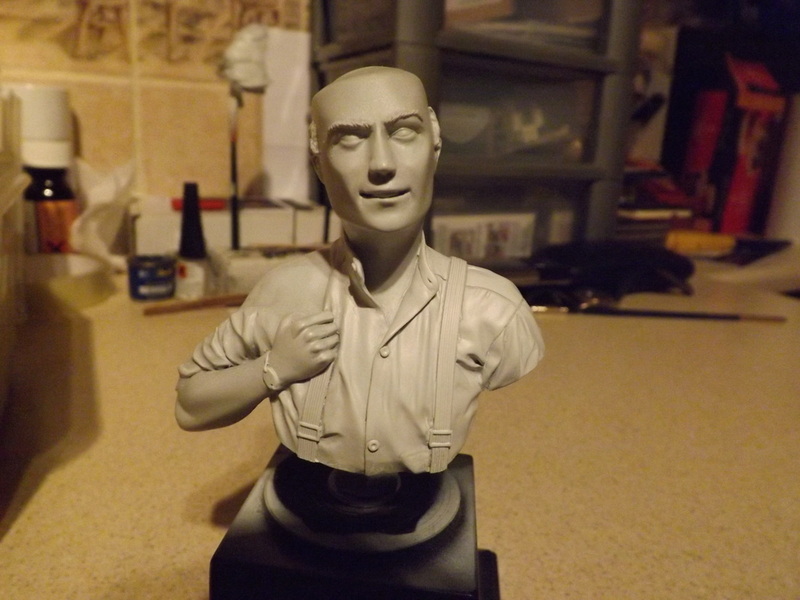 Well folks, here it is. I recall a few club members asking me how the Oshkosh was going, and would i be putting any photographs on the website? 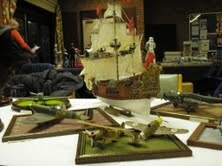 I've remedied that, so please have a look, and hopefully enjoy them. I started this mammoth kit on Boxing day last December, and i'm pretty pleased with the outcome. The turnbuckles actually work, and i used them to tighten the chains, the hooks on the end of the chains are cast brass, and the shackles on the load, also work, having a 1mm threaded bolt. 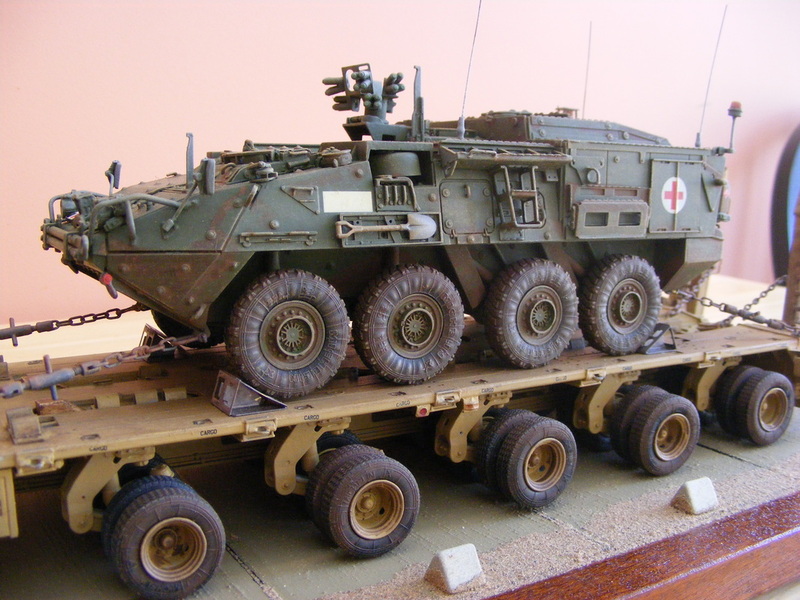 For interest, the tractor is designated as the M1070, the trailer M1000, and the load, is the Stryker M1133 MEV (Medical Evacuation Vehicle). Well, i managed to salvage the base of my diorama i was building, by using plenty of PVA glue, plenty of clamps and lots of crossed fingers. (See further down this page). 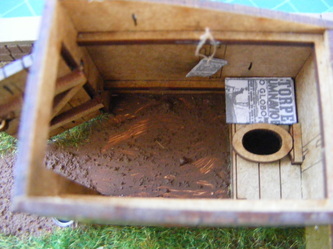 The finished project pictures are below this article. Hope you like it. 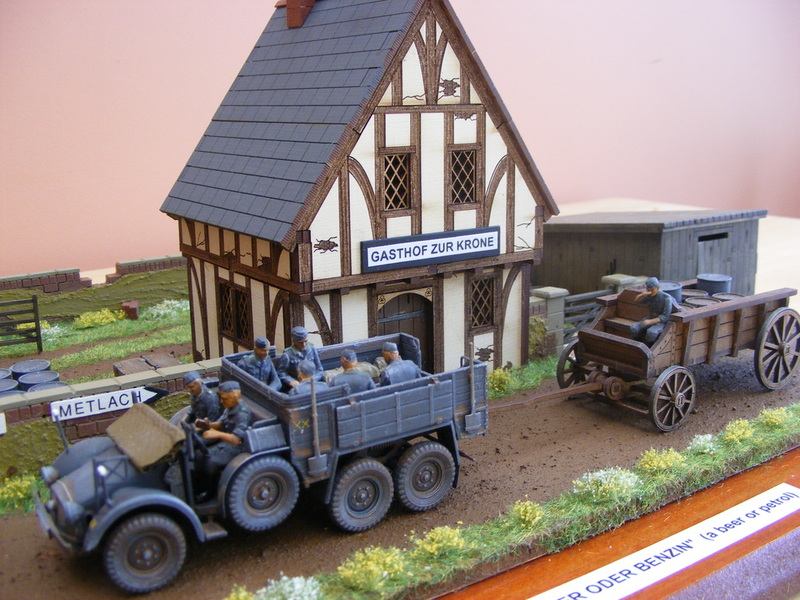 What they couldn't know, was that within the next winter of 1945, one of the bloodiest battles of WW11, would decimate the towns and villages in this area. 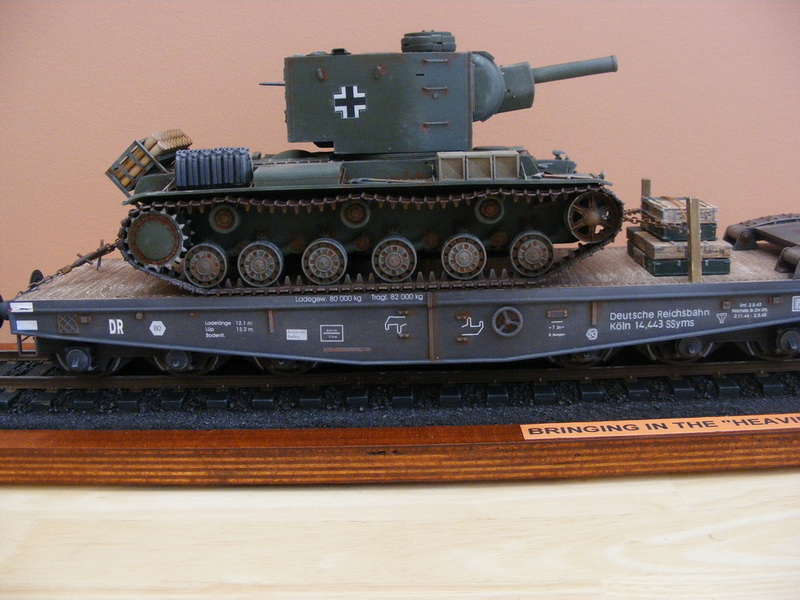 The Battle of the Bulge. 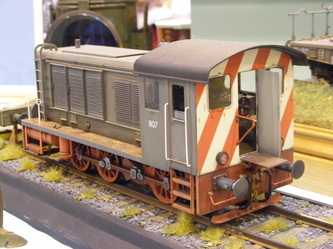 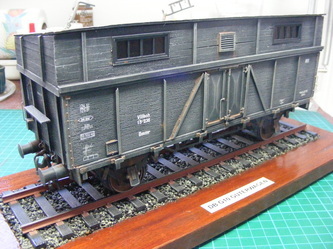 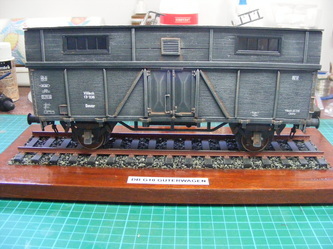 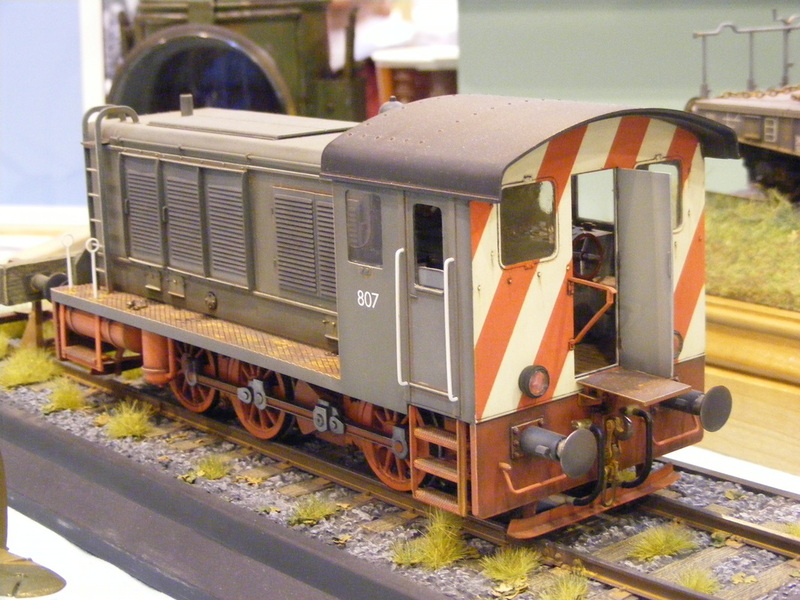 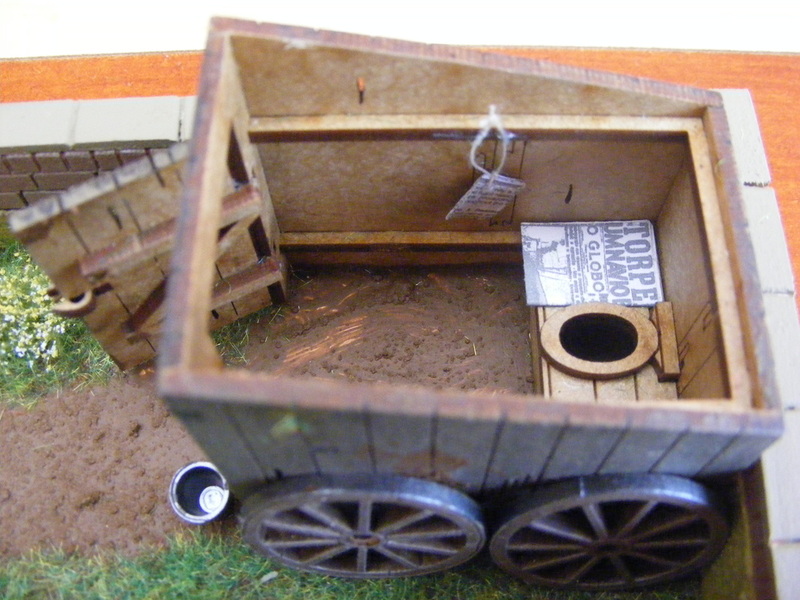 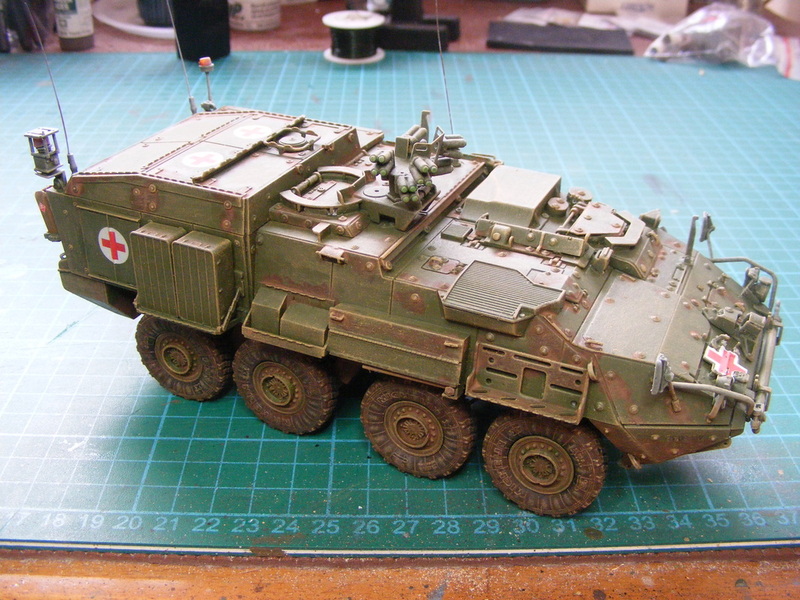 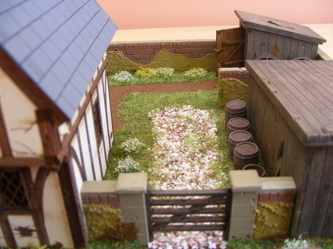 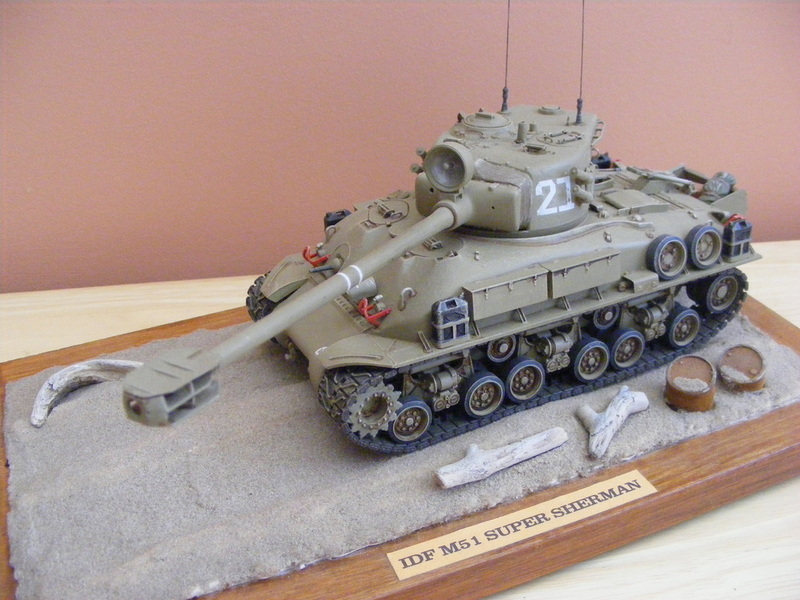 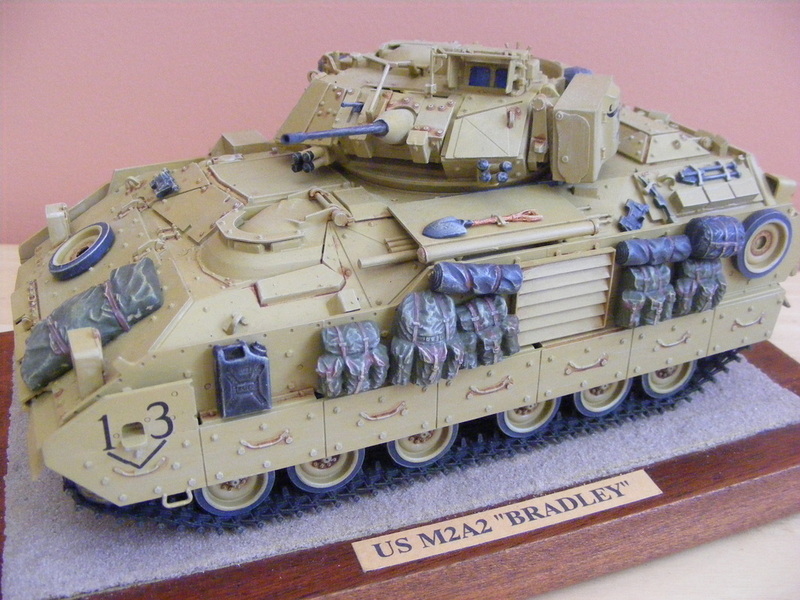 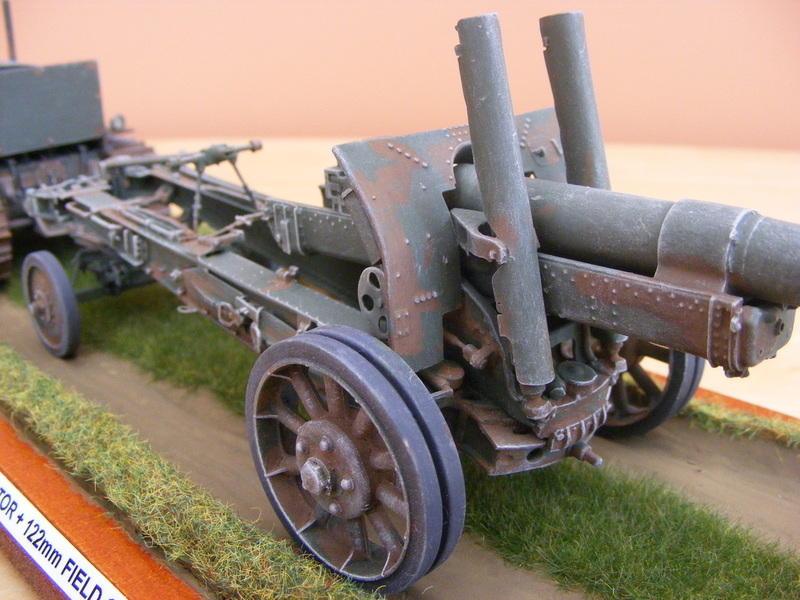 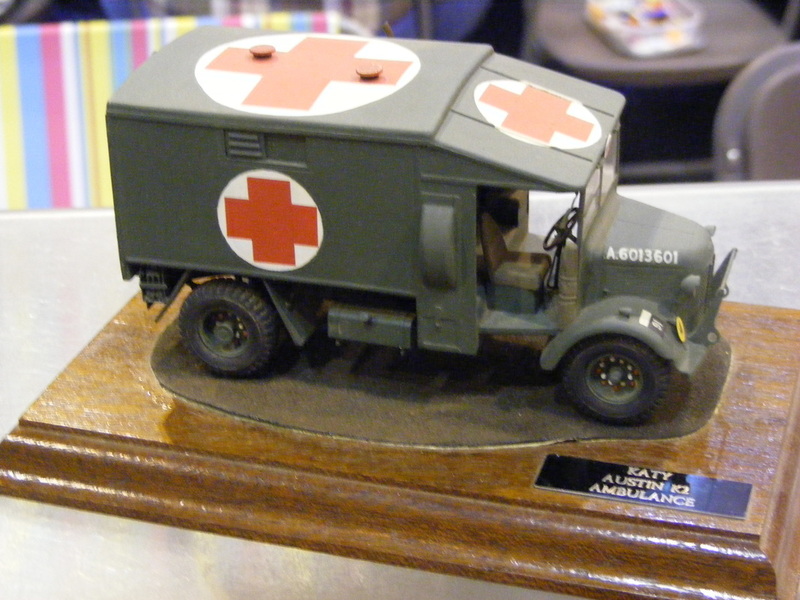 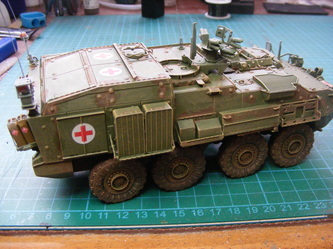 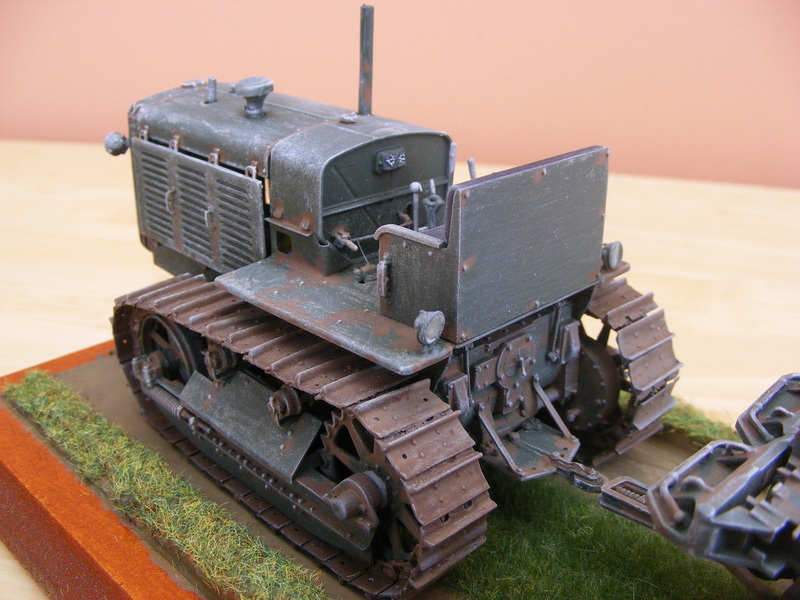 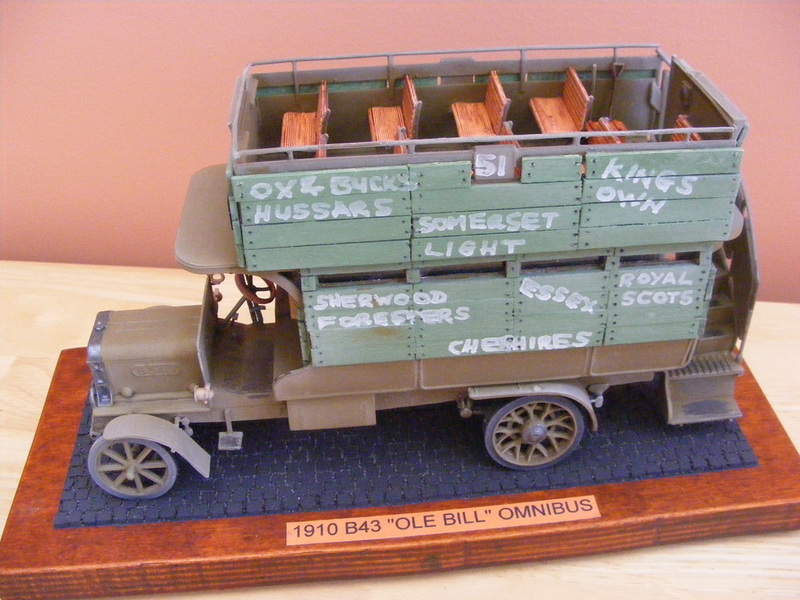 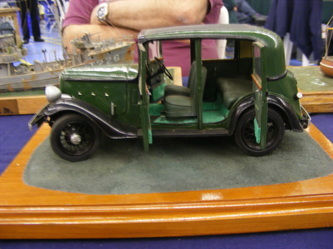 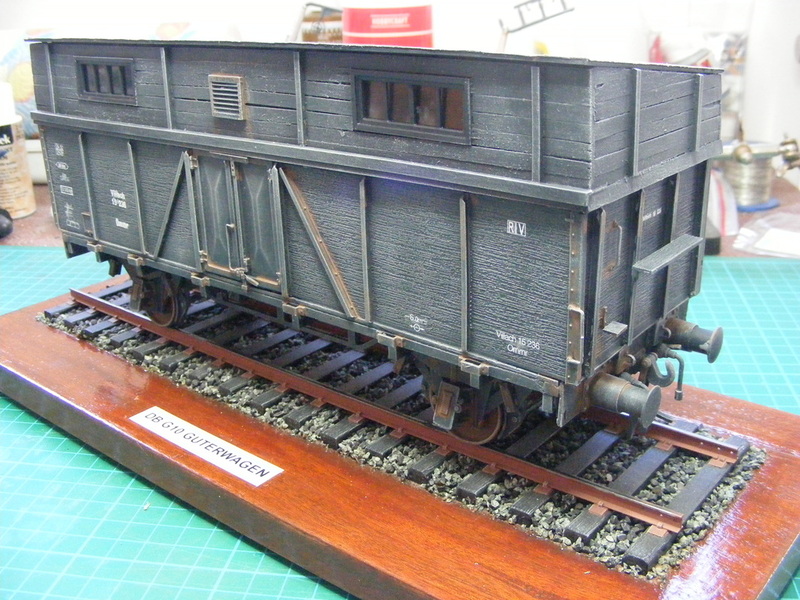 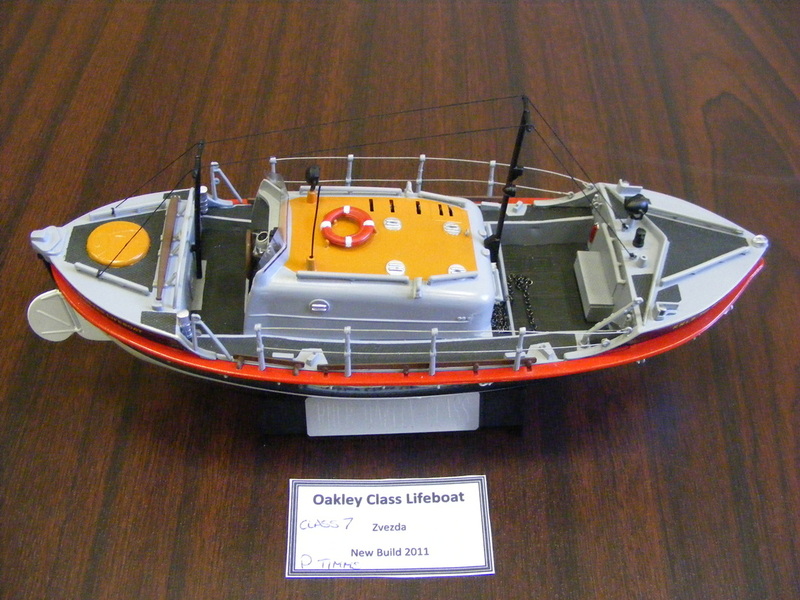 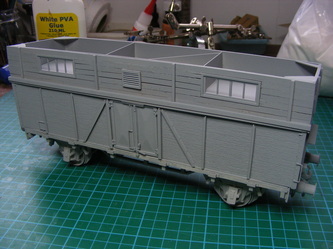 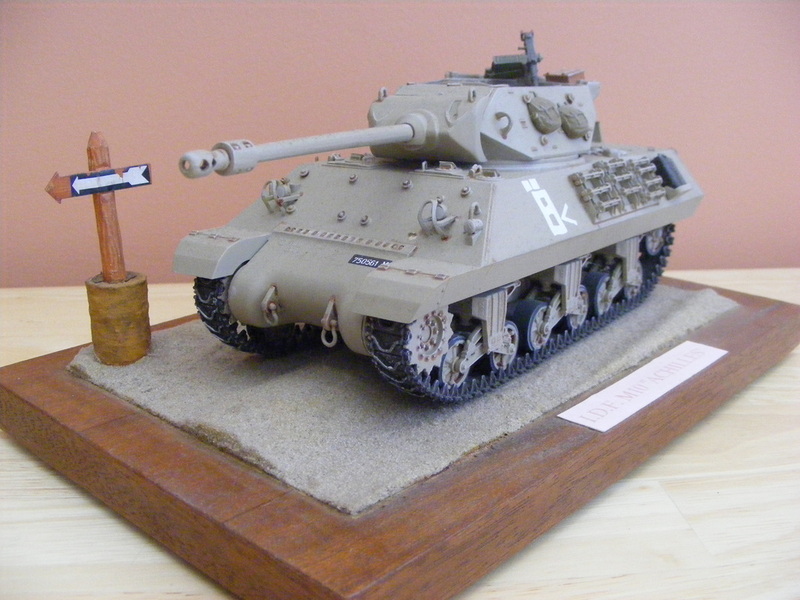 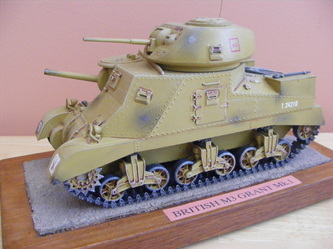 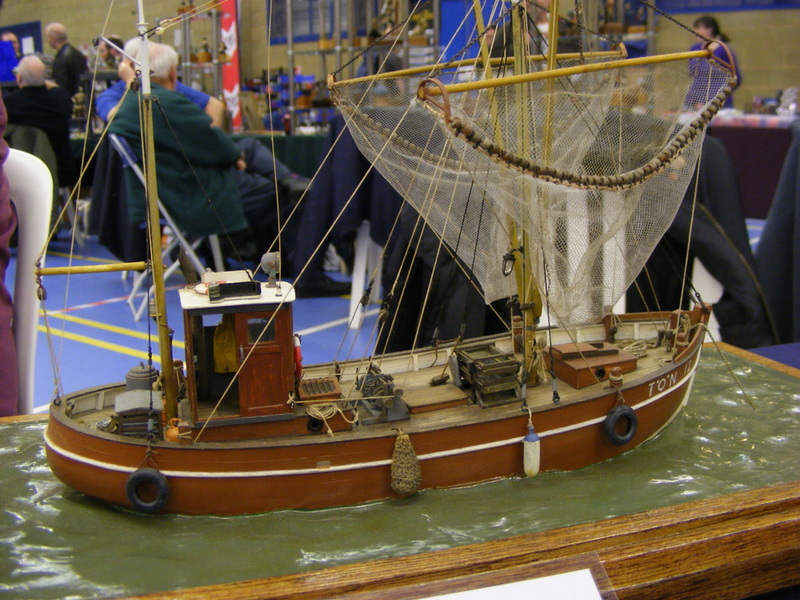 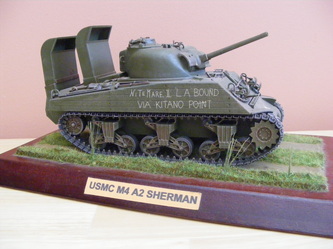 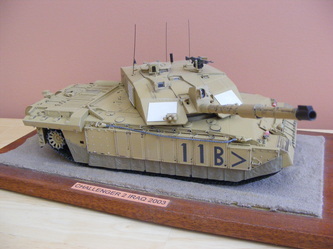 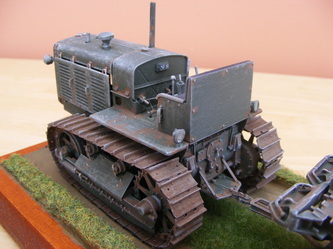 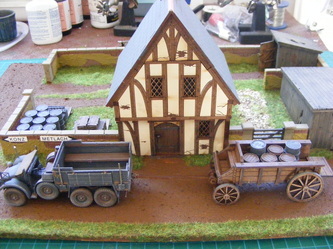 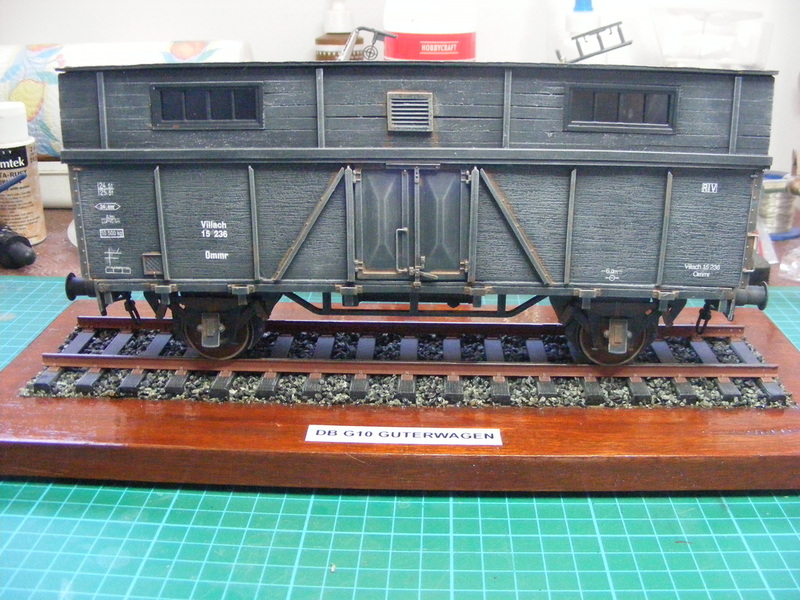 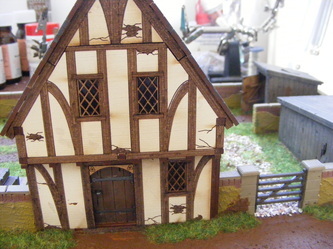 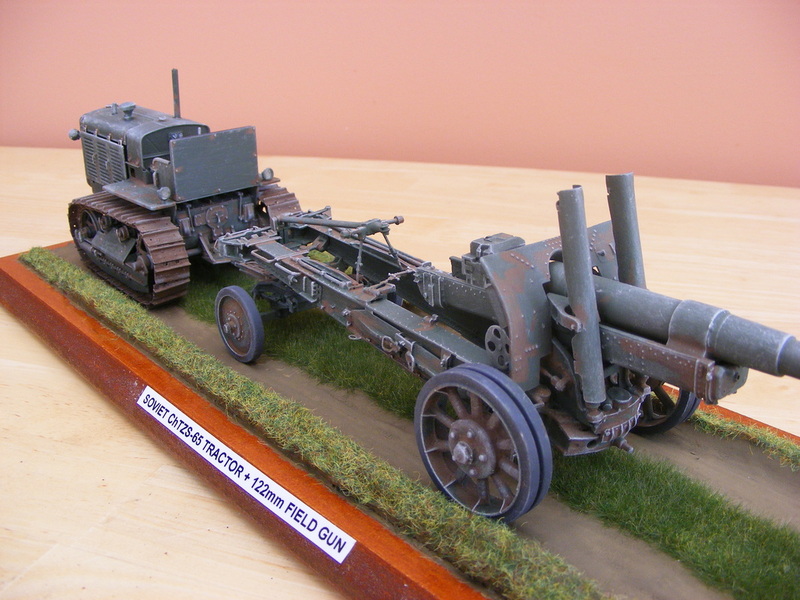 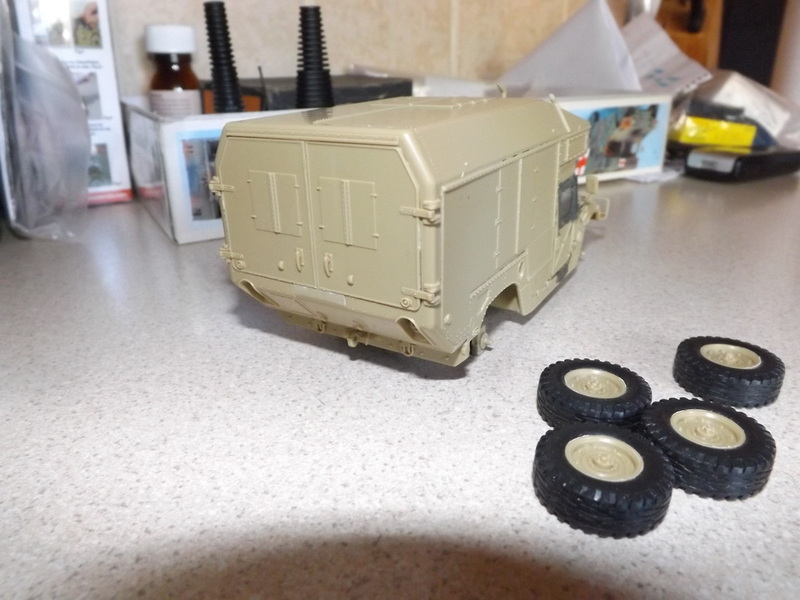 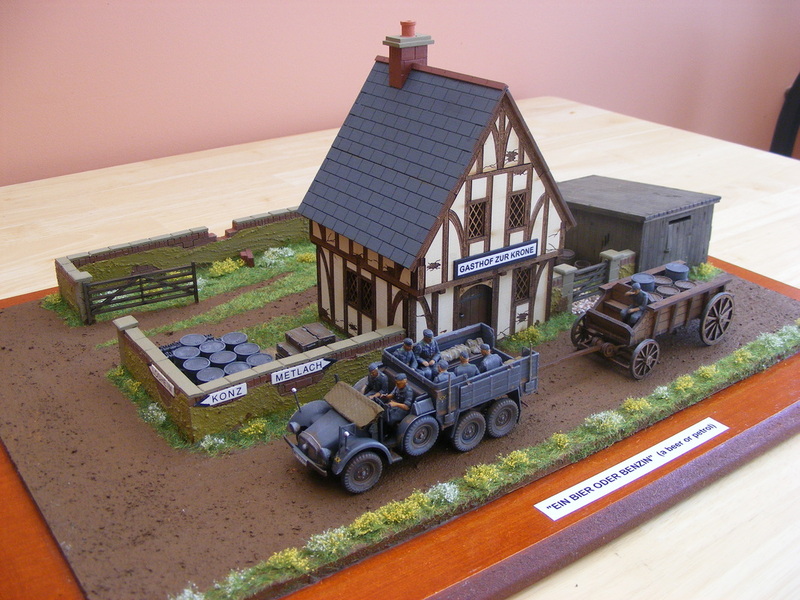 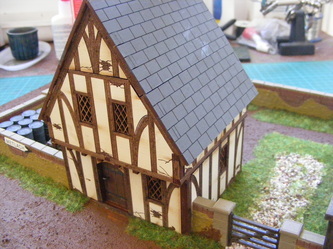 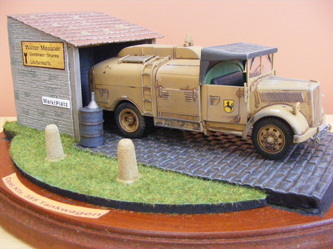 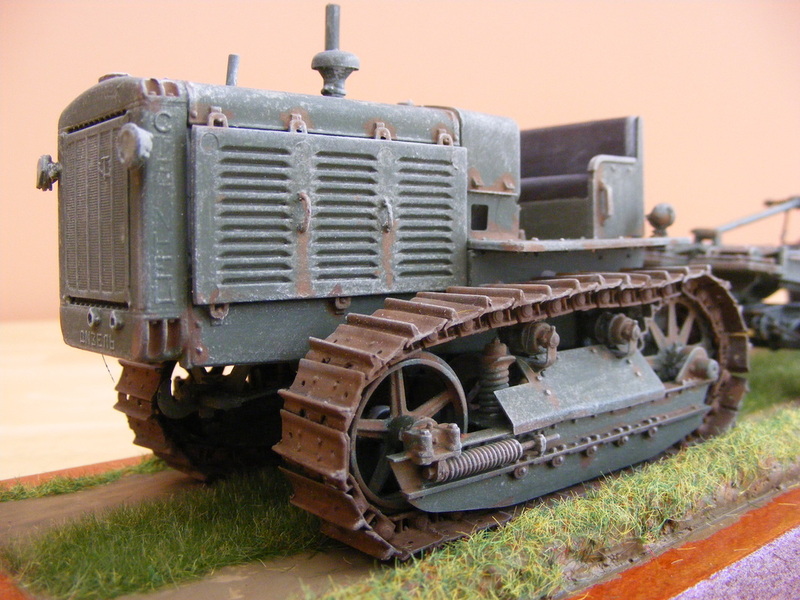 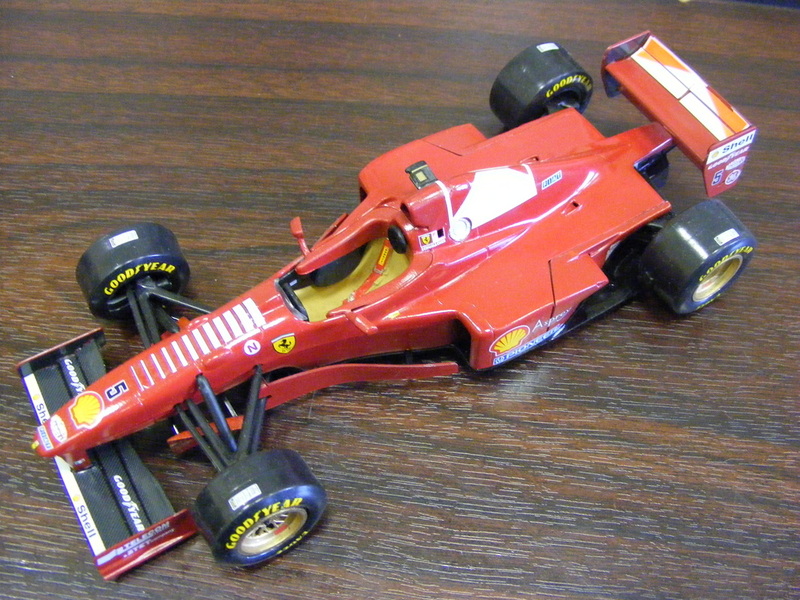 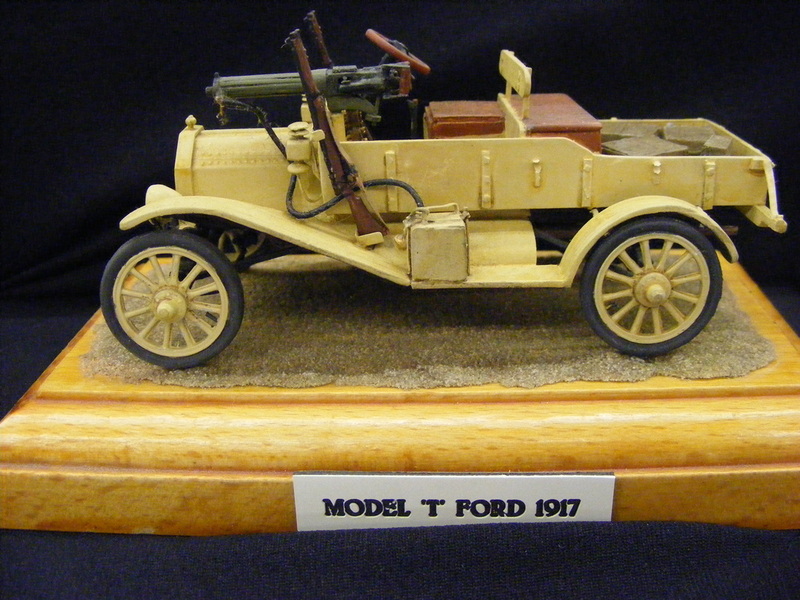 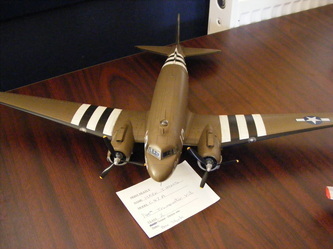 Below is another of Graham's just completed models. 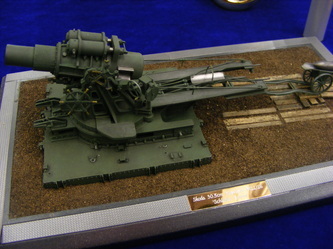 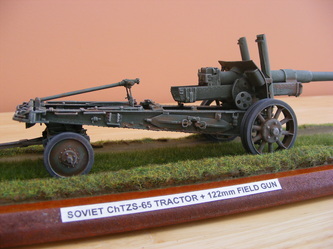 Soviet ChZ S-65 Tractor together with a 122mm Field Artillery Gun. 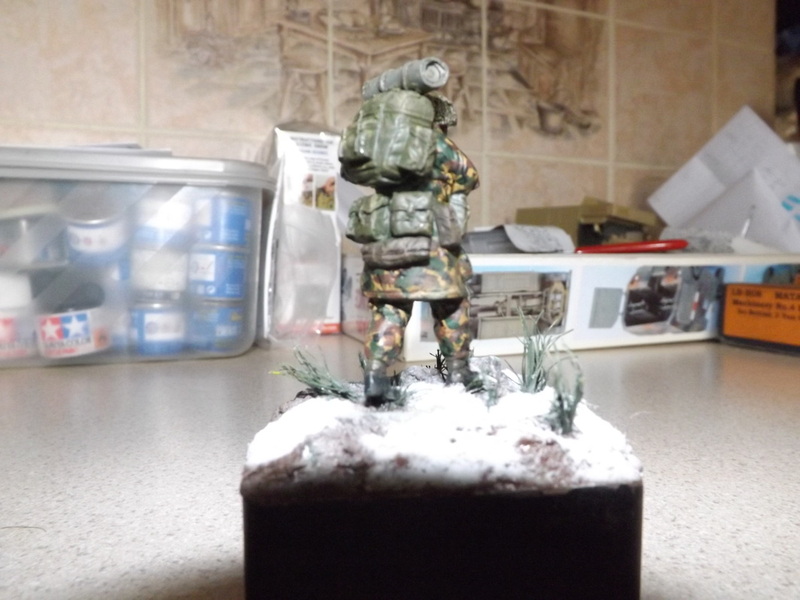 And now for something different??????? 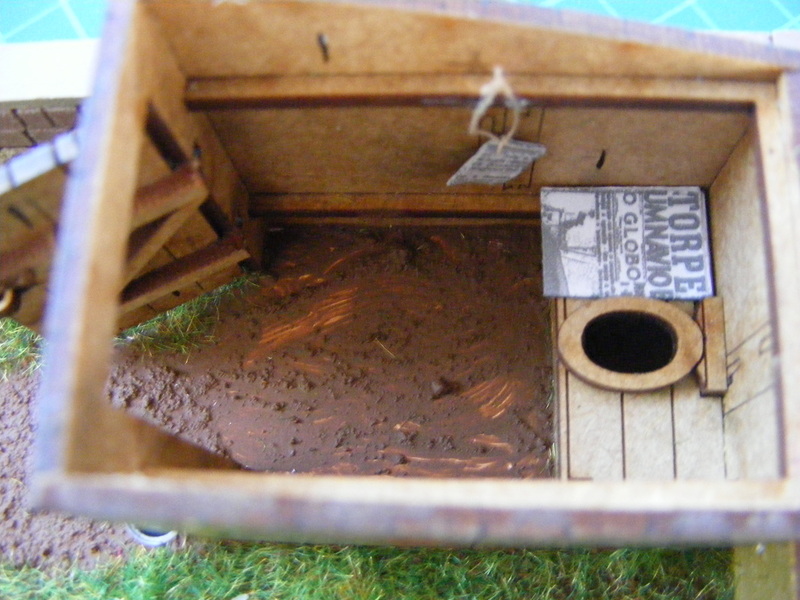 The following 6 photographs are of a diorama i've been working on for a short while. "i hear you say. 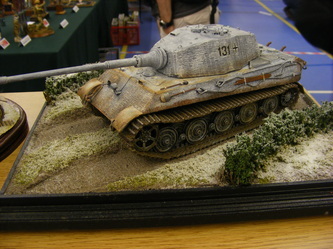 Well, the difference is, that it's in 1/48 scale, and that is quite a change for me. 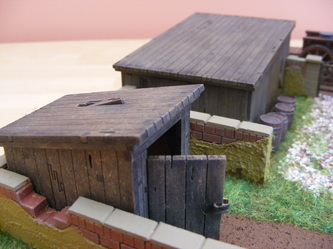 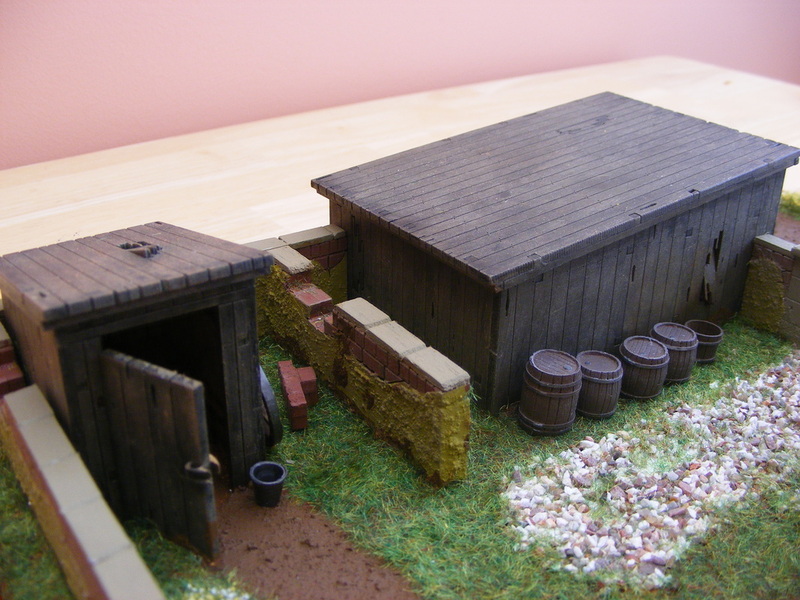 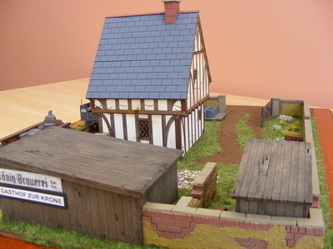 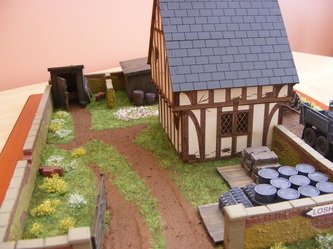 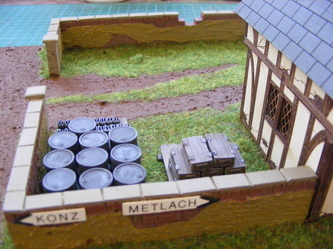 The reason for this change, (only temporary i might add), is the fact that i was so taken with the quality of the buildings, walls etc, that i purchased at the Allumwell War-gaming show, that i decided to incorporate them into a diorama. 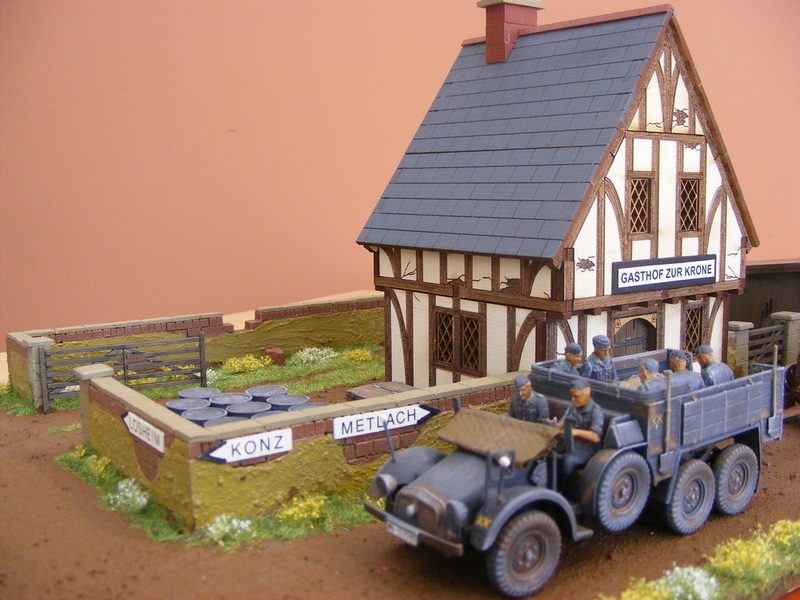 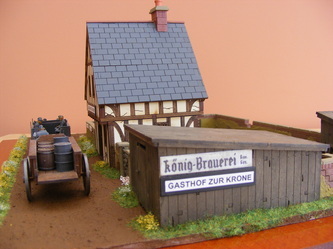 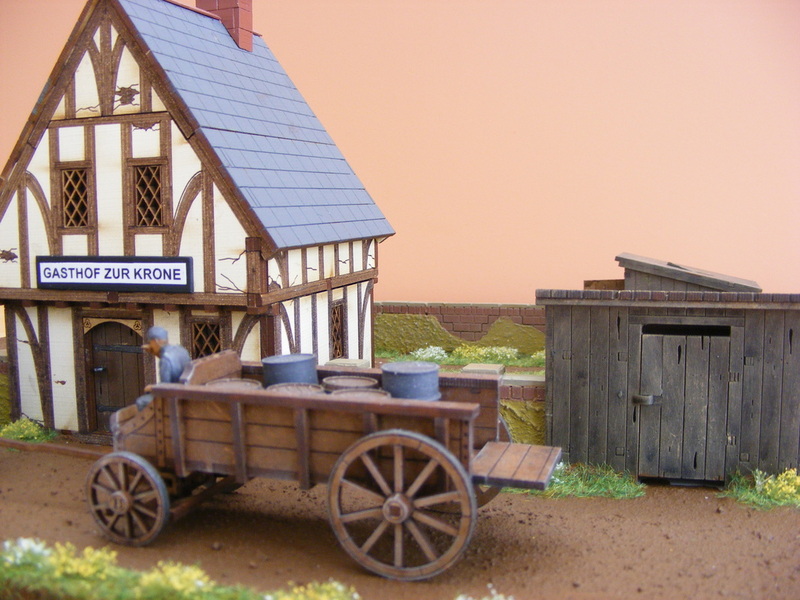 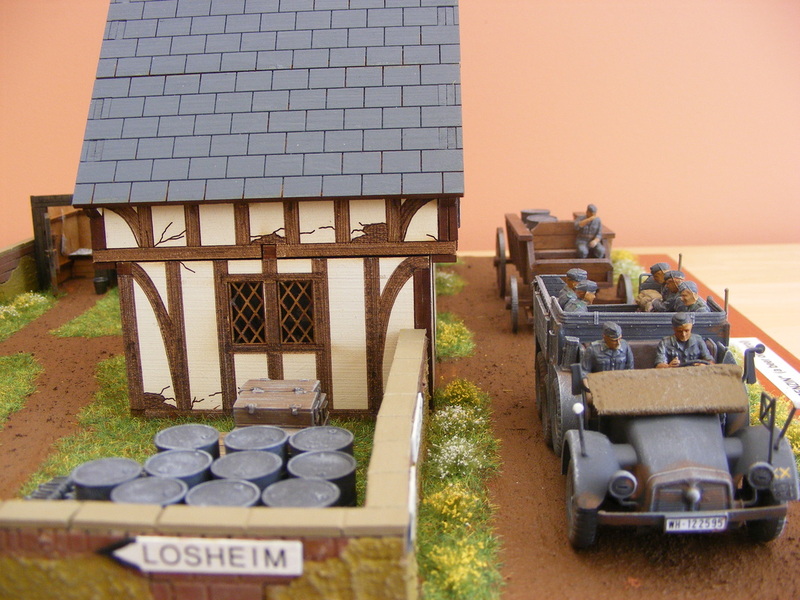 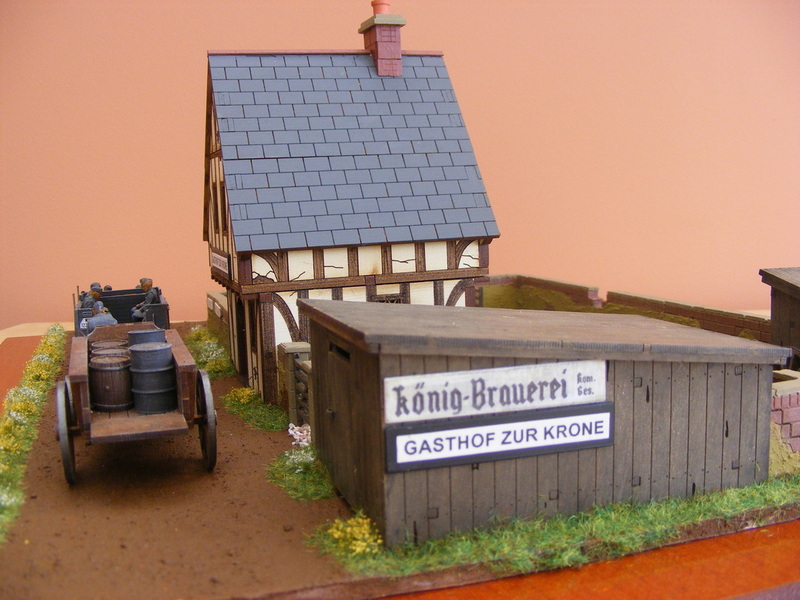 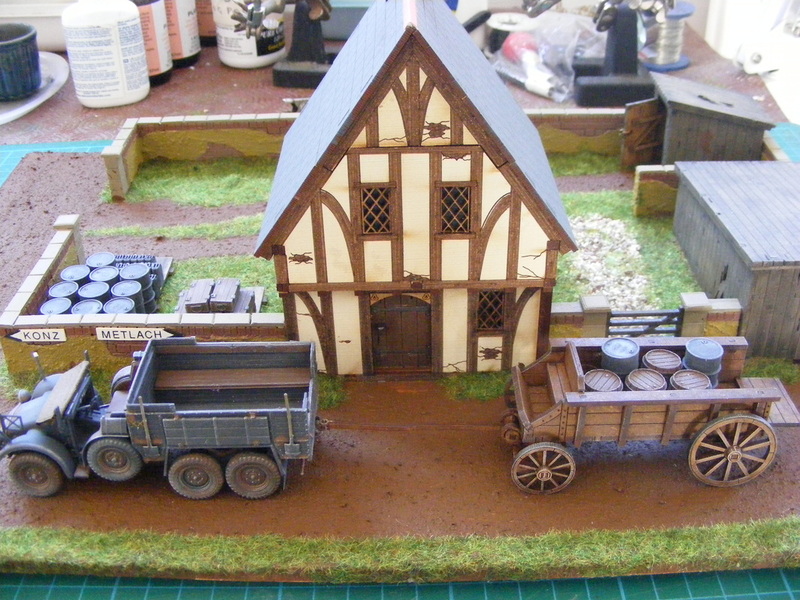 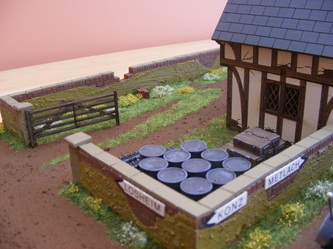 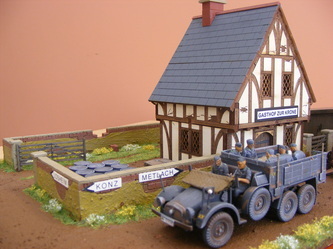 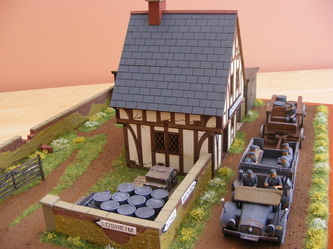 I've tried to set the scene as a temporary small country supply depot at the rear of a gasthof, (german pub), in the Saar Valley in spring 1944. 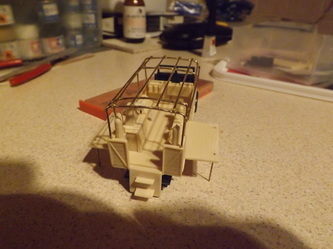 It's not quite finished yet, in fact i've hit a snag. I used piece of foam board as the base, to be attached to an MDF base when completed, however, the groundwork was started using a product called Basetex. 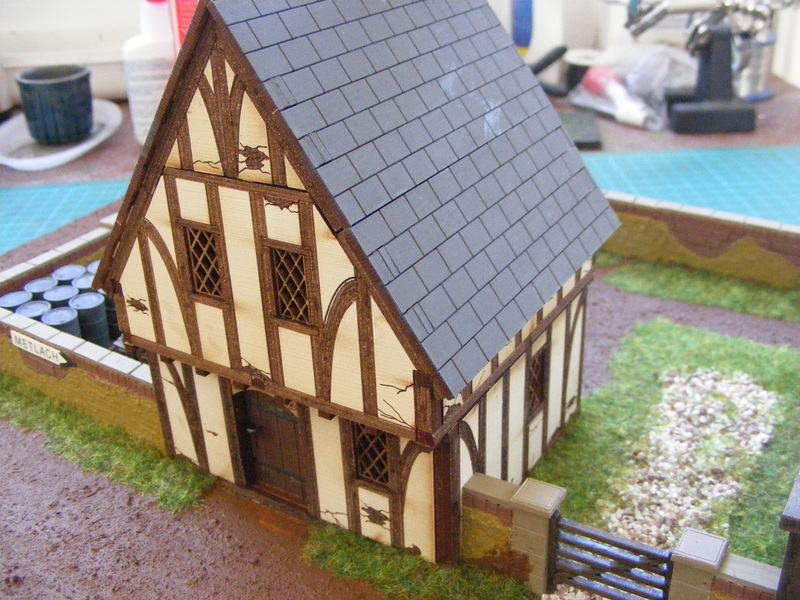 Problem was, that as it dried, it tightened the board up, and that promptly curved, so much so in fact, it looks as if i'm going to have to clamp it down physically to the MDF, in the hope that the foam board doesn't separate under the pressure. If it does, i think i can separate all the items from the board, and start again, fixing straight to the MDF. 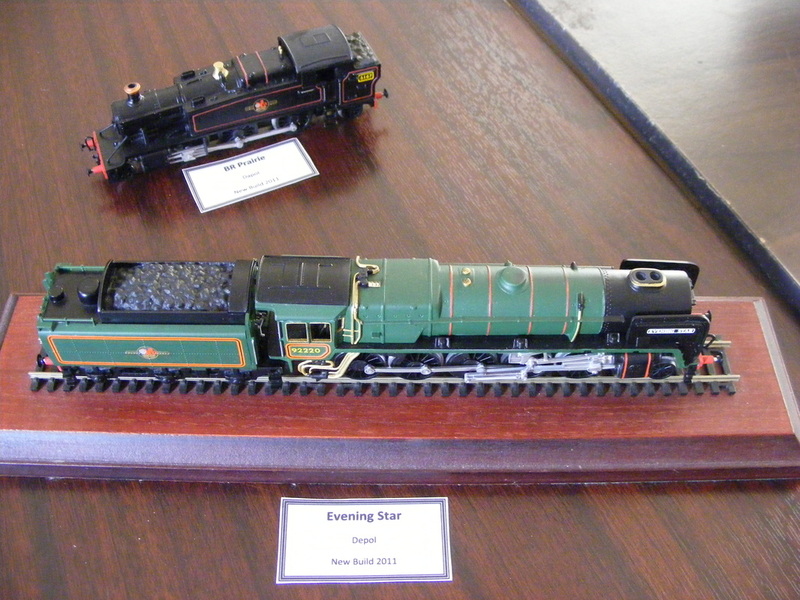 Only time will tell???? 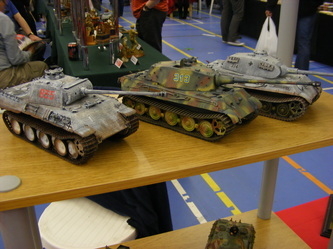 Anyway , enjoy the pictures, any comments are always welcome. Here are a few pictures of Graham's latest finished model. 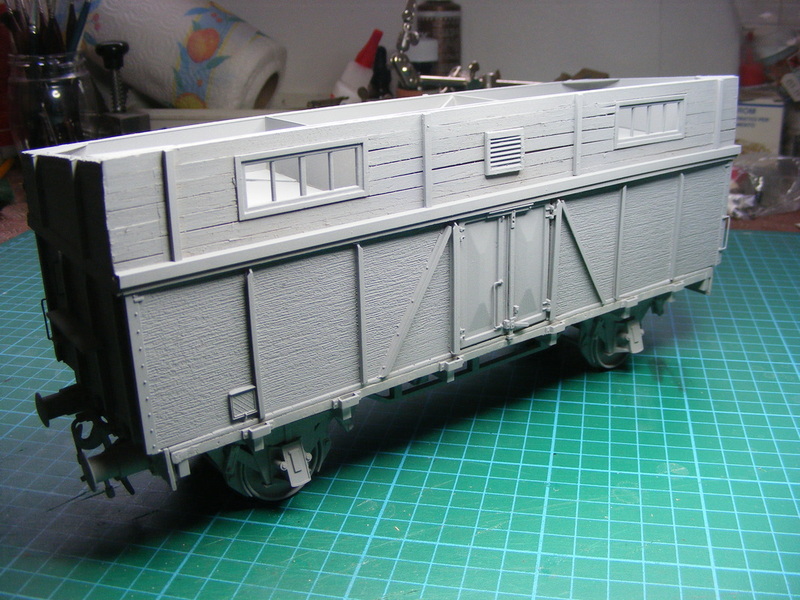 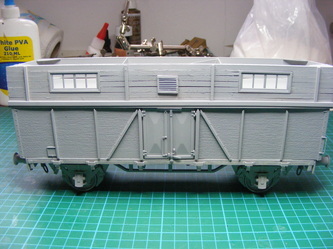 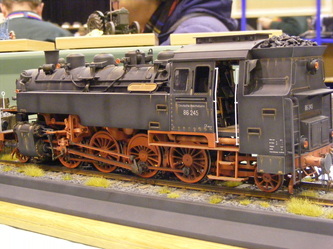 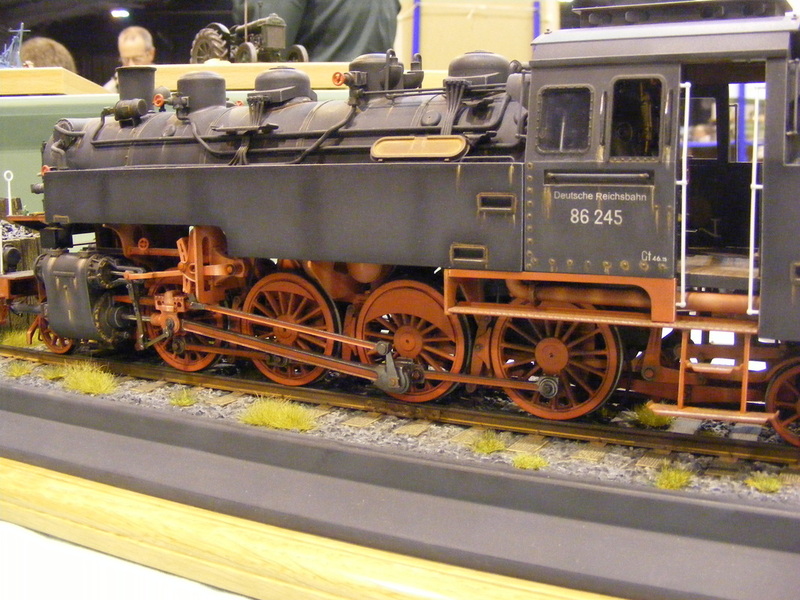 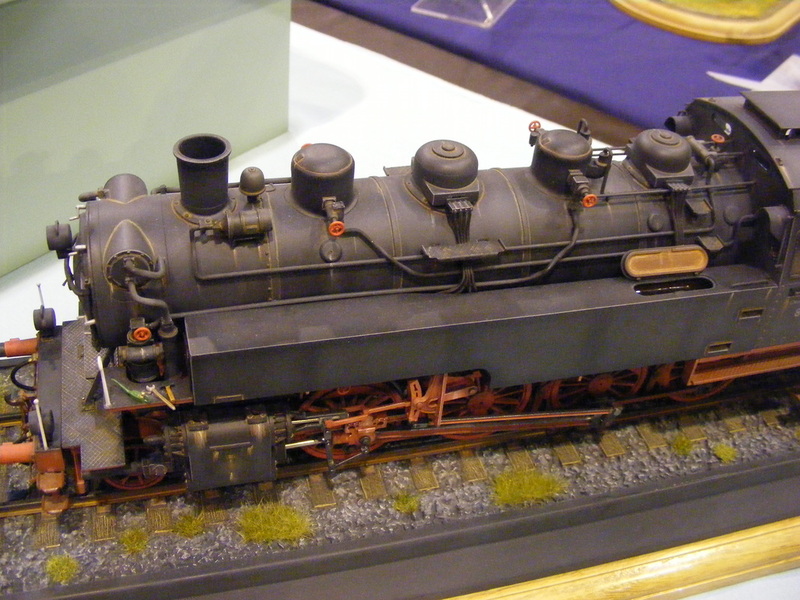 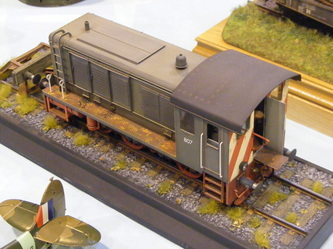 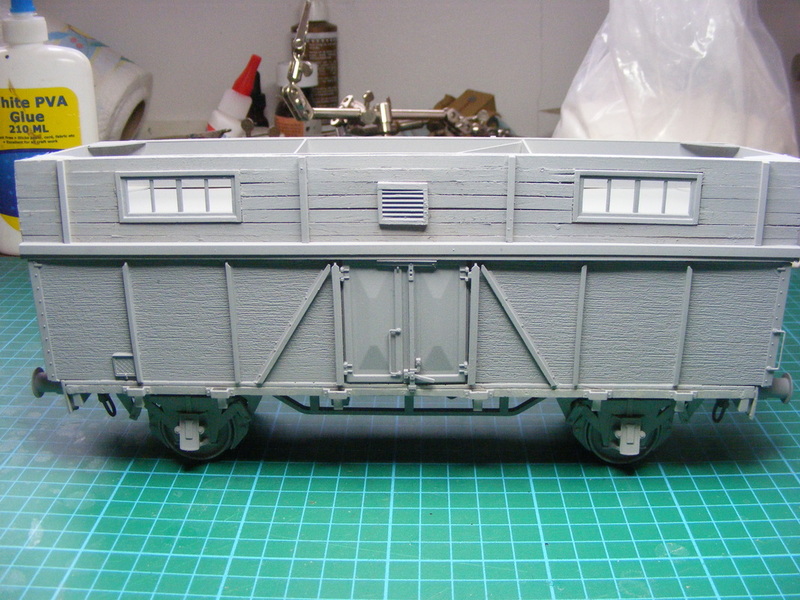 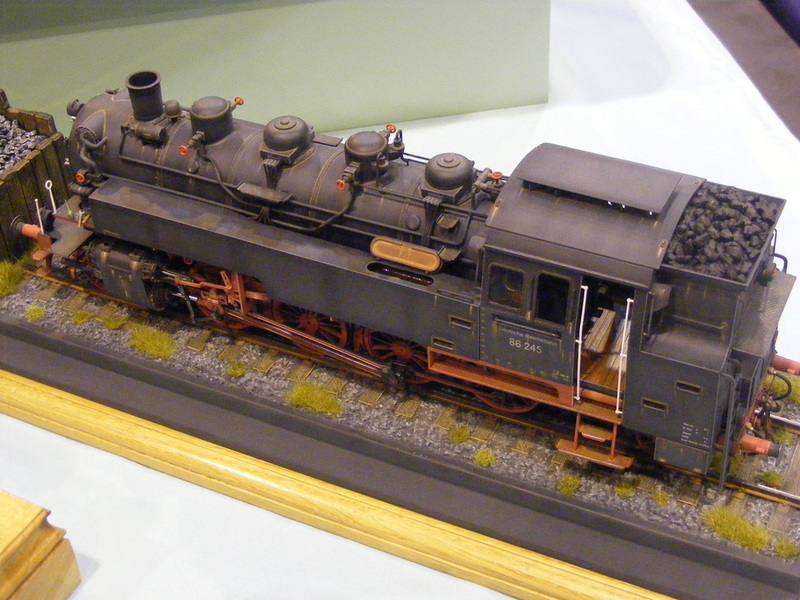 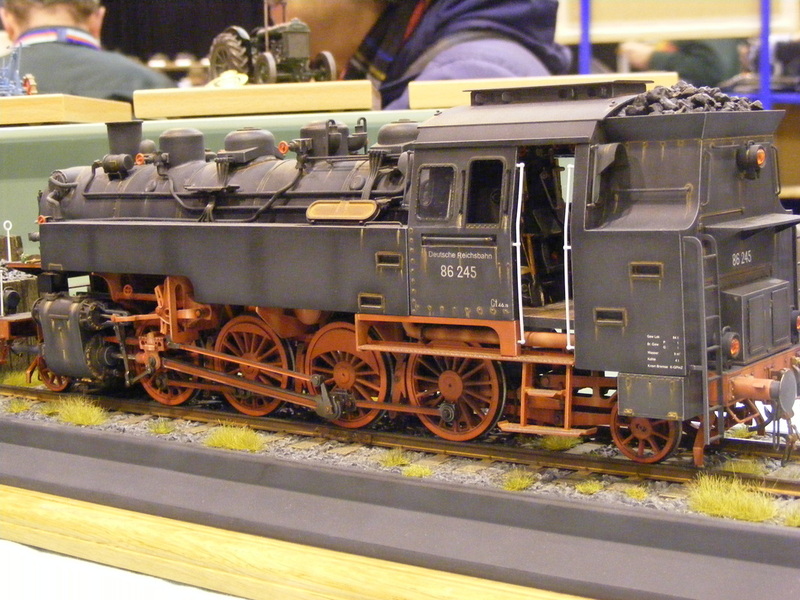 It is a German Reichsbahn converted G10 wagen. It was used as an accommodation and transport vehicle, for personnel who were needed to man the very large assault guns. 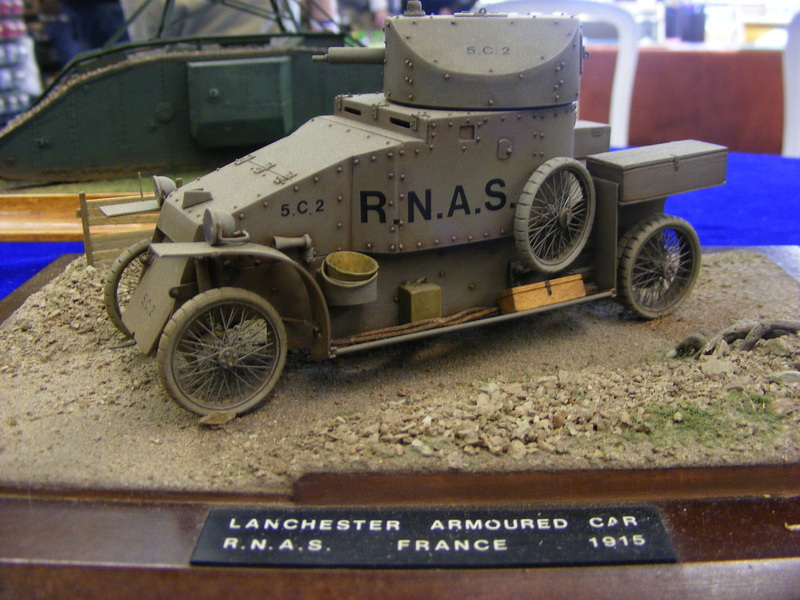 of TAS Armour, so thanks Ian, i very much enjoyed building this one. 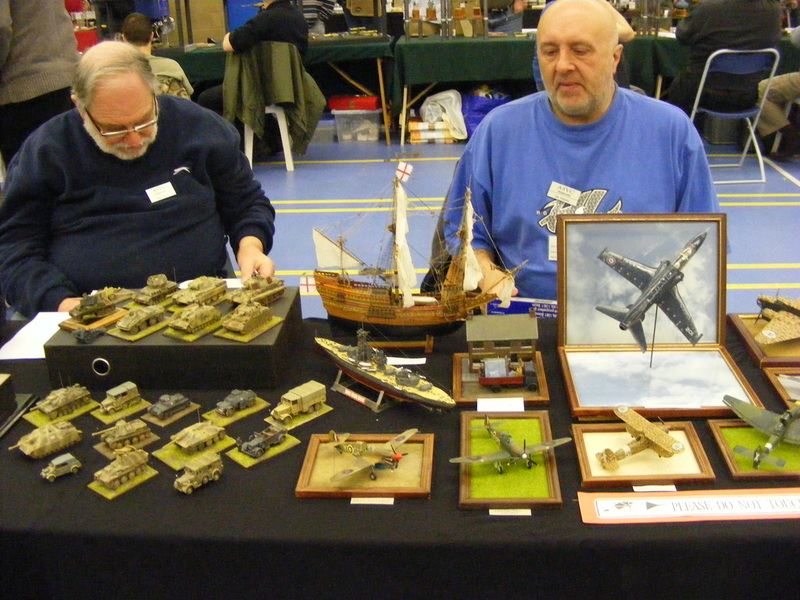 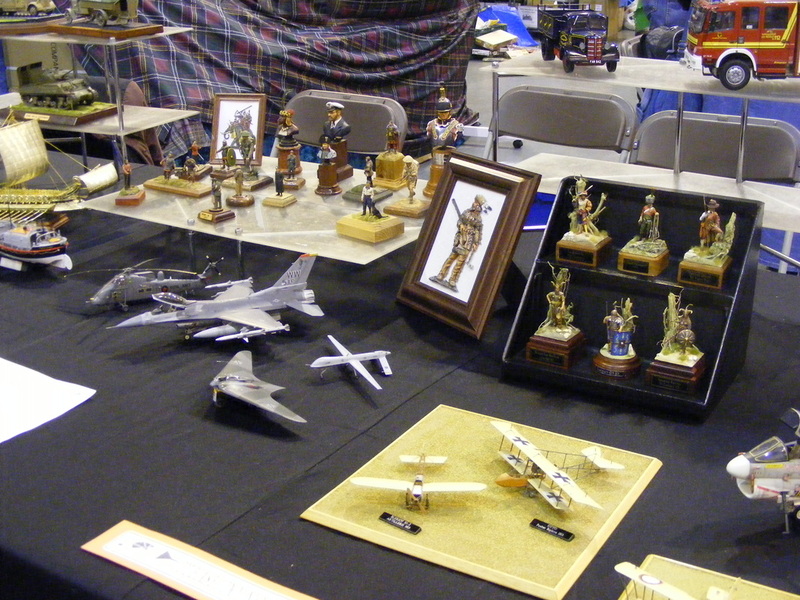 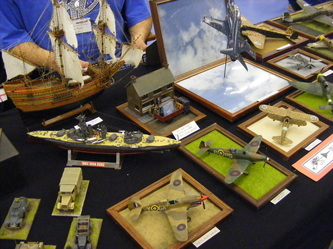 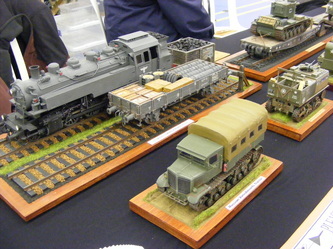 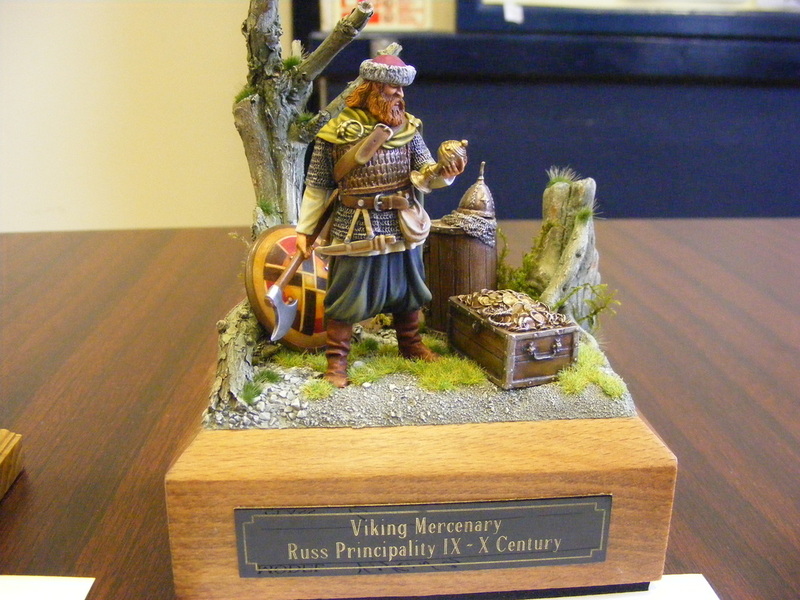 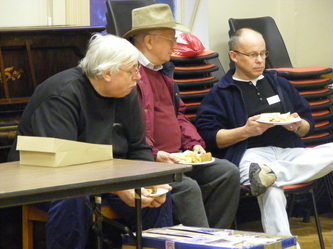 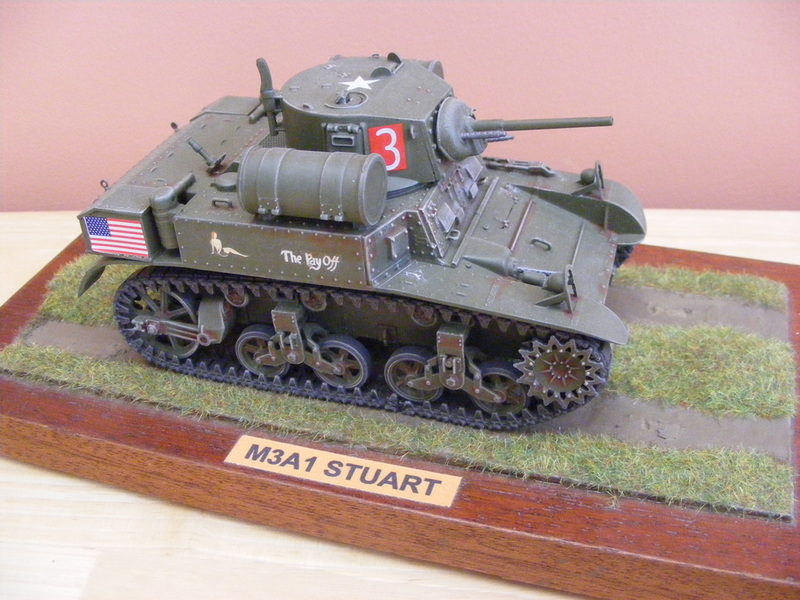 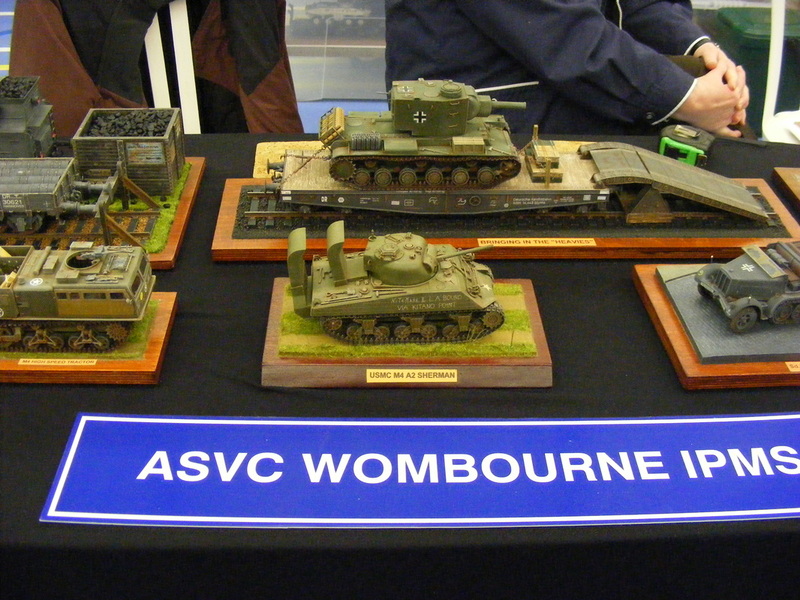 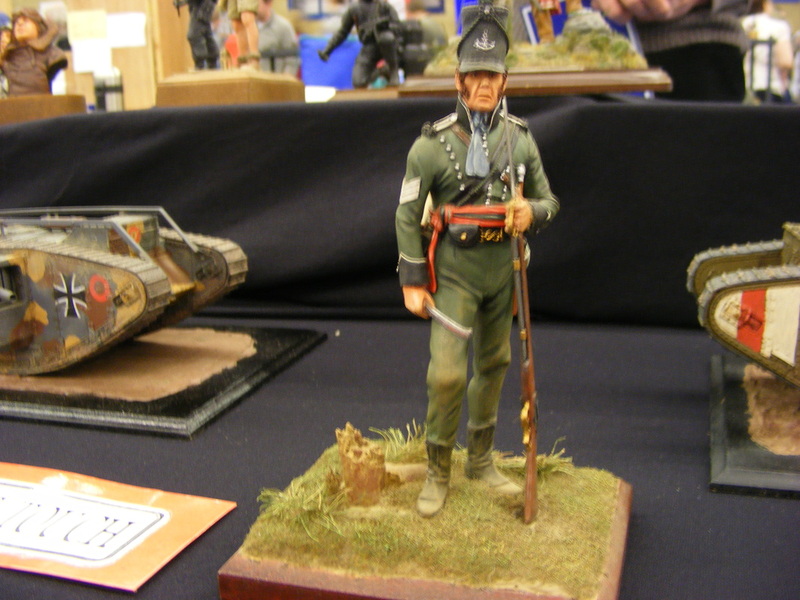 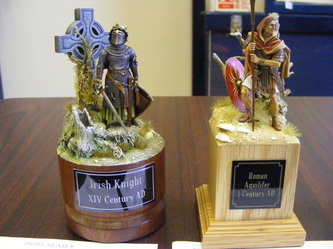 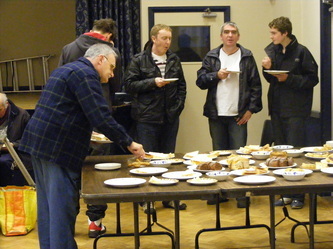 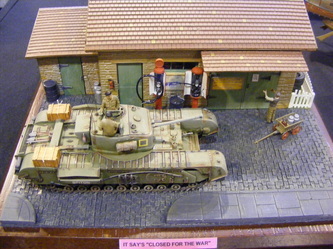 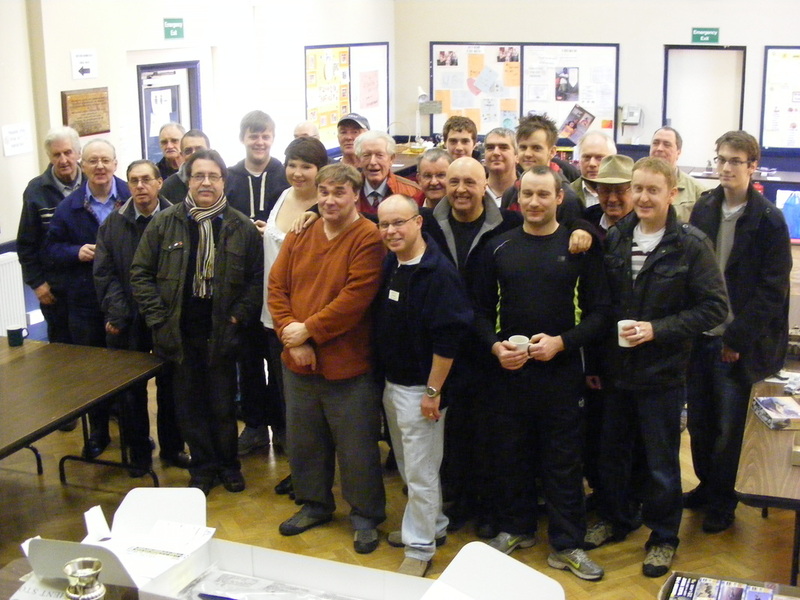 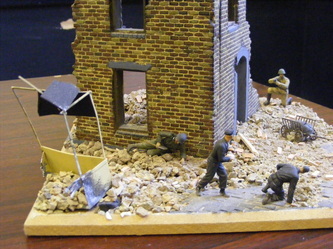 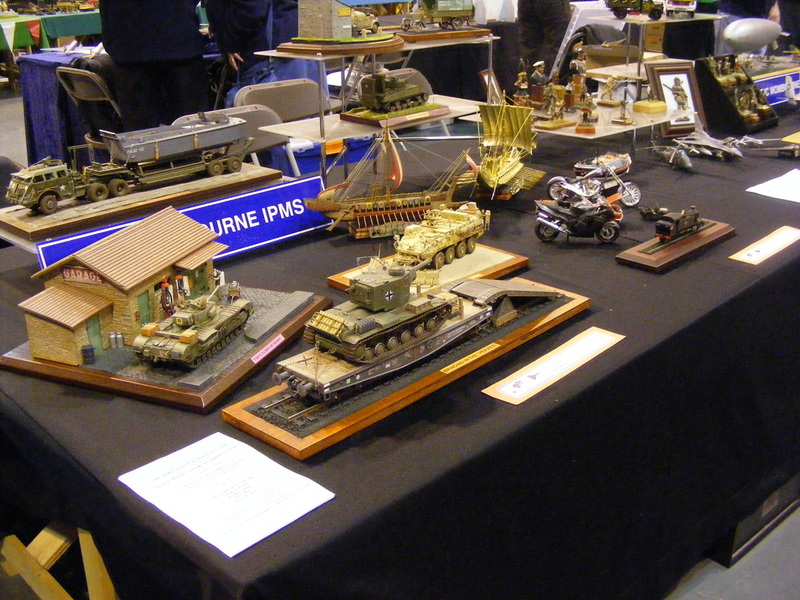 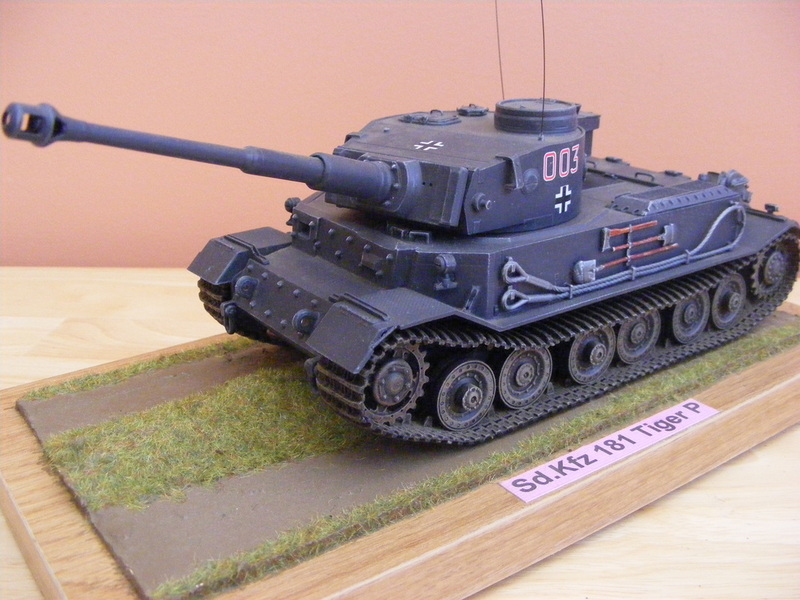 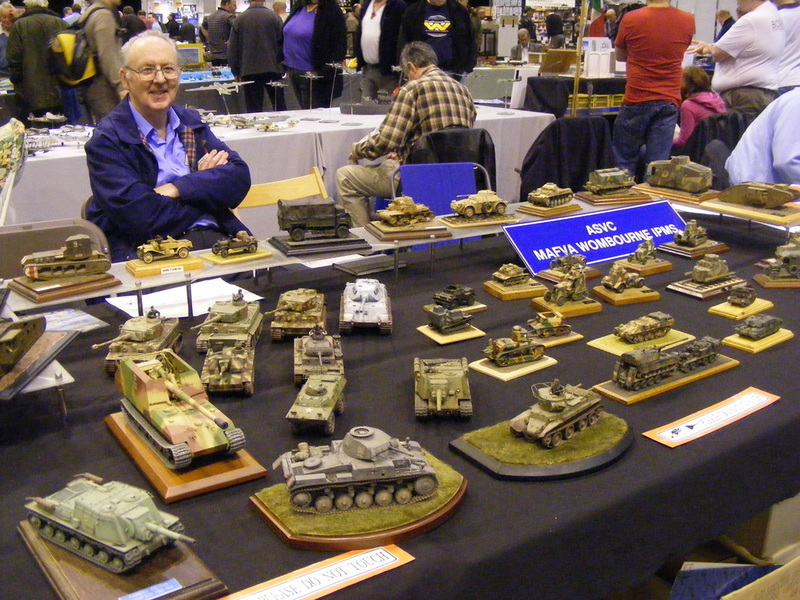 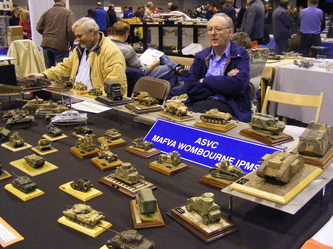 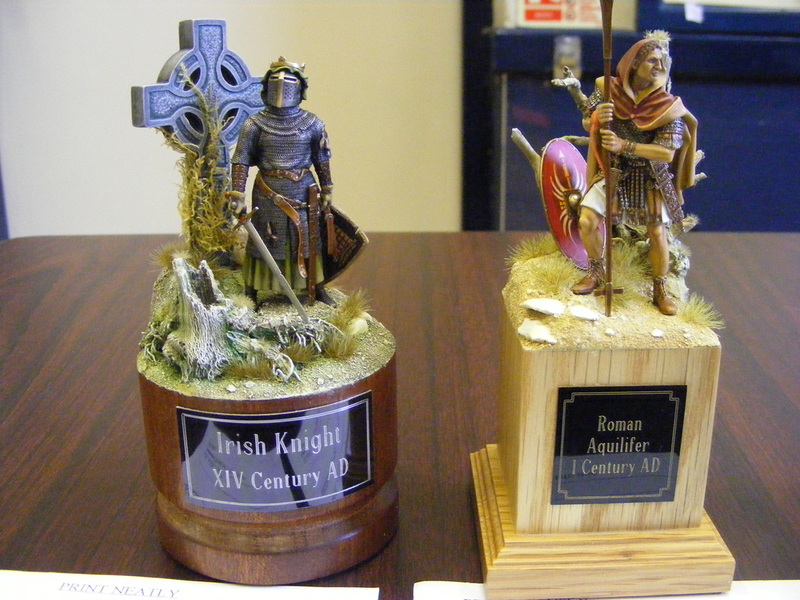 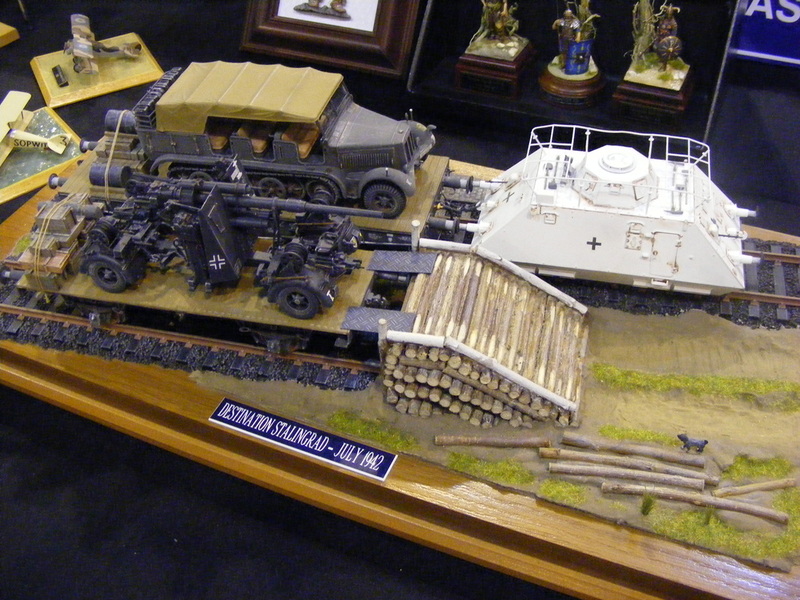 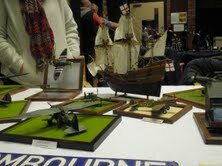 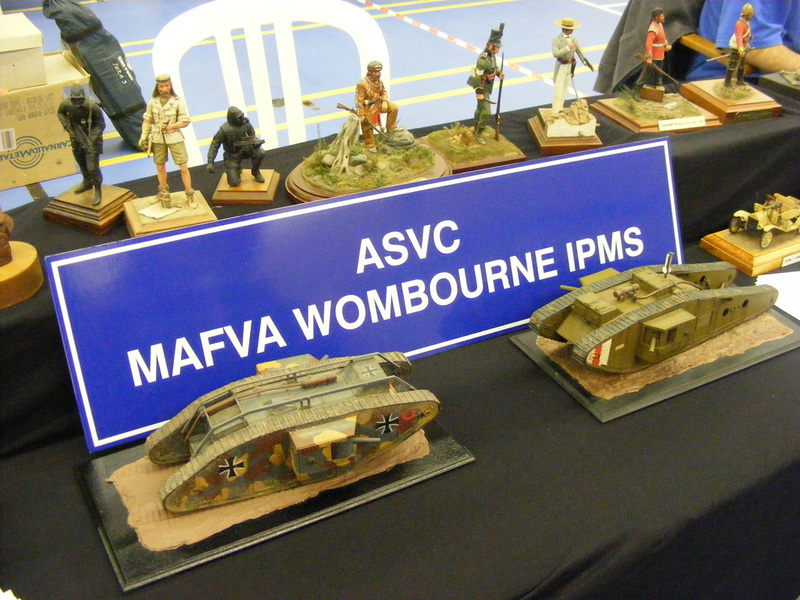 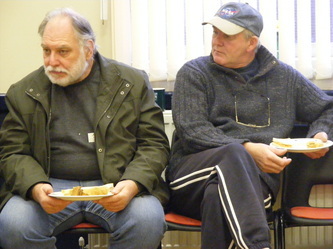 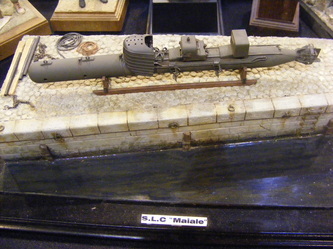 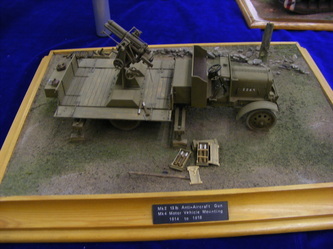 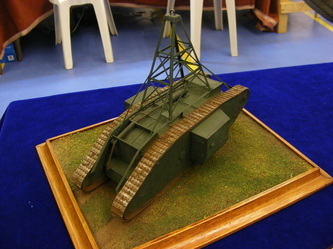 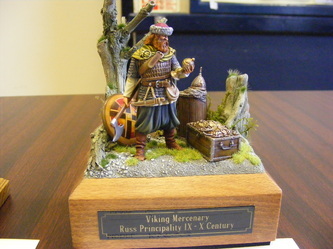 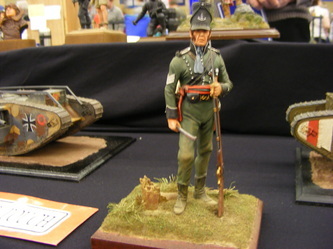 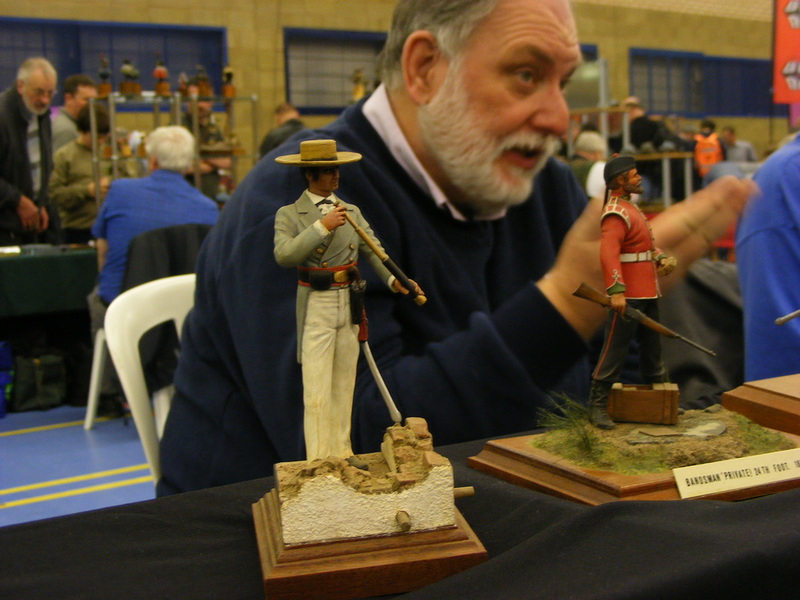 Last sunday, (11th march) the club attended the annual Alumwell War-gaming and Model Show. 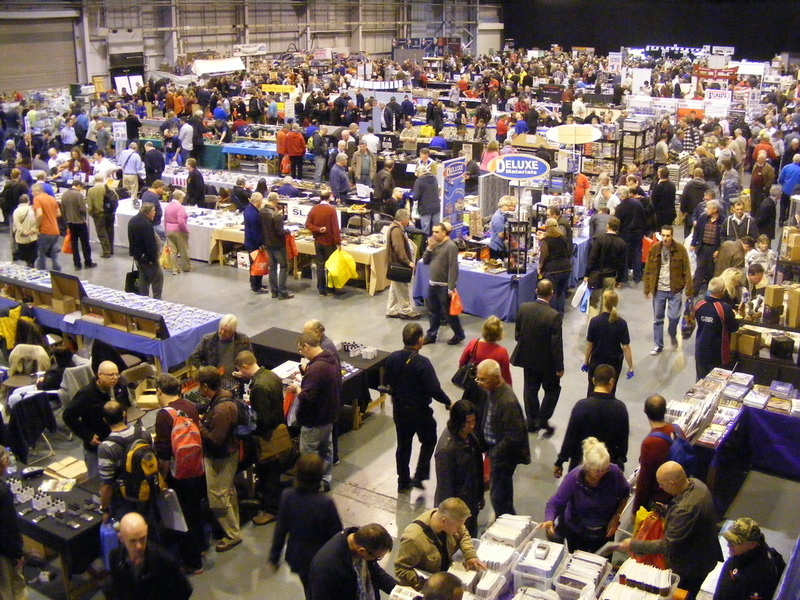 This show is held in the sports hall at Aldersley Stadium in Wolverhampton, having moved it's venue from Alumwell School in Walsall, (hence the name). 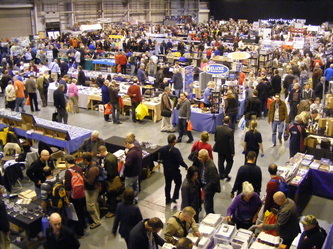 A lot of visitors were there on the day, in fact, i can never remember so many visitors at this show before. 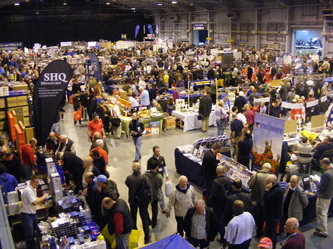 It was very busy all day. 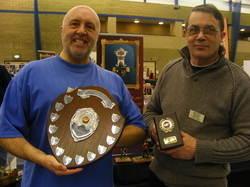 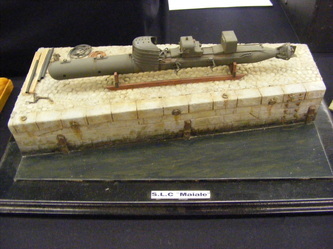 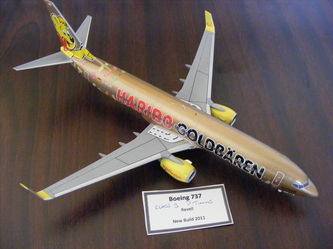 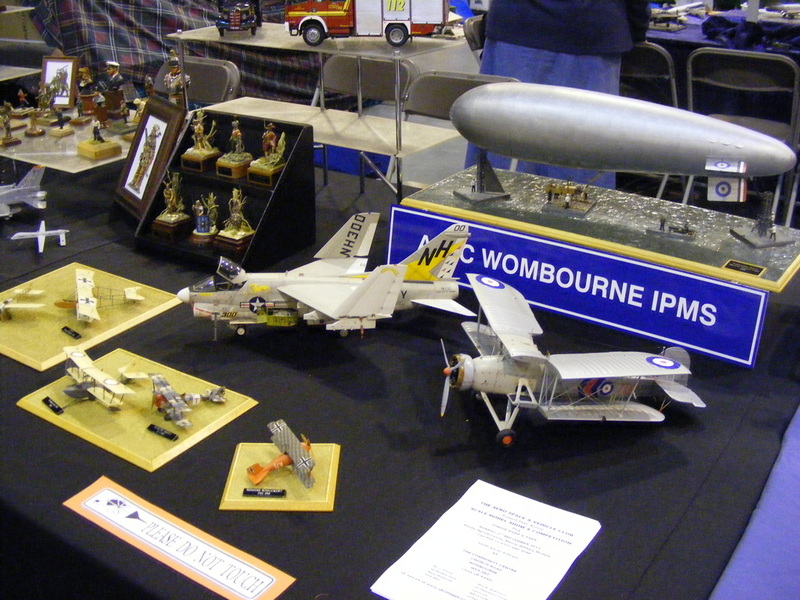 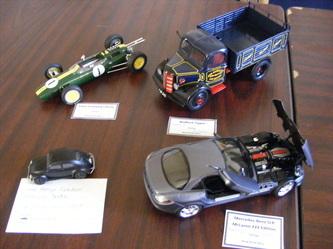 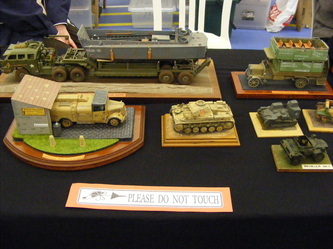 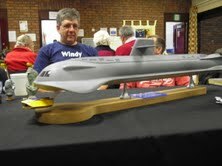 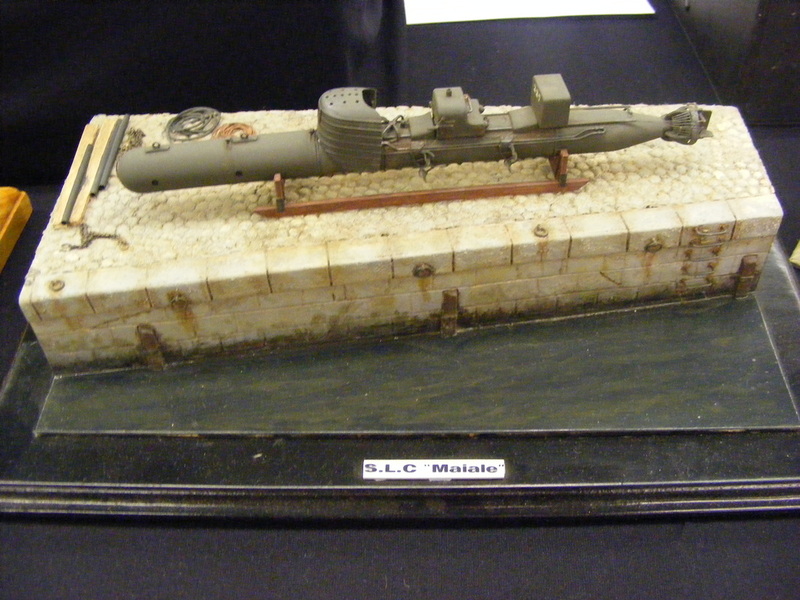 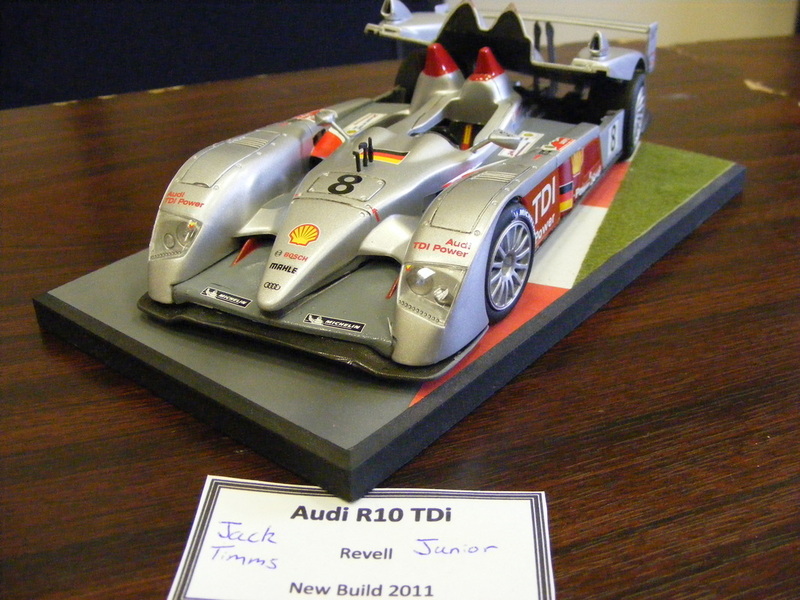 John & Ian with the "Best Club Modelling Display for 2012"
Well done to all that attended a very good show. 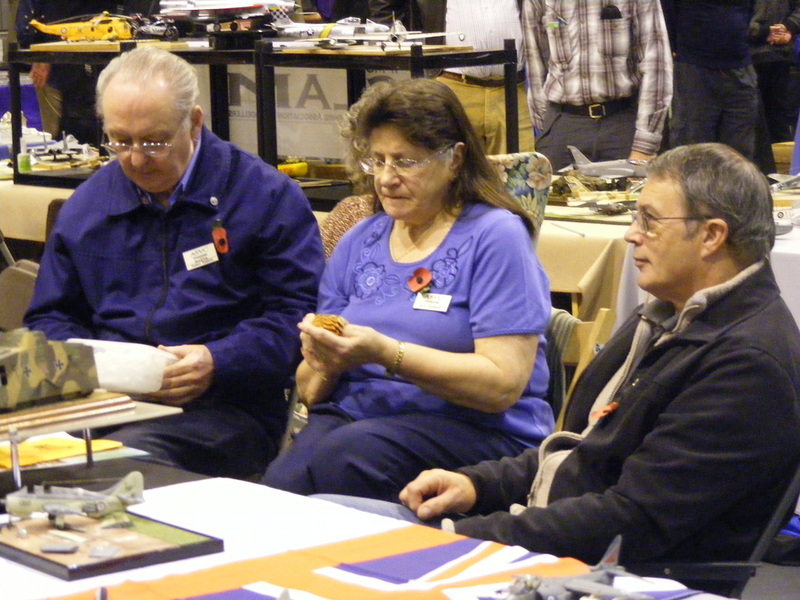 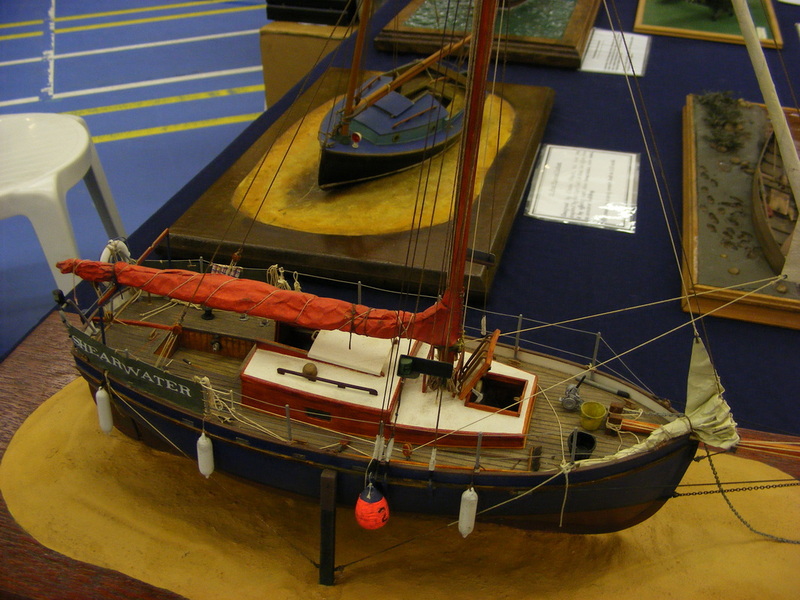 Ian & Carol with the club stand on February 26th at the Crewe Model Show, at the Oakley Centre in Crewe, Cheshire. Ian says he always enjoys this show, as they have enough of a variety of exhibits to appeal to most visitors on the day, and plenty of traders to help you part with some cash. 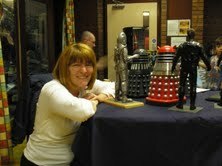 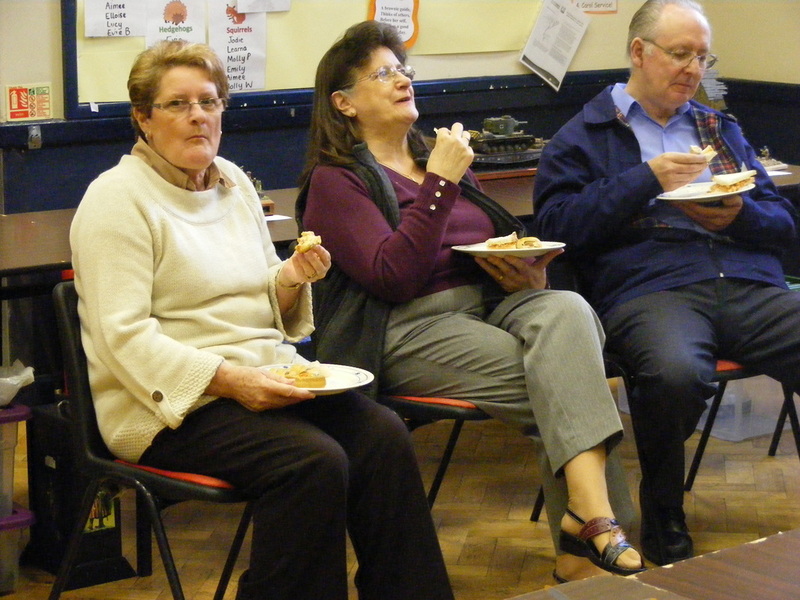 As you can see, Ian & Carol met a few old friends during the day. Thanks to you both for the report and pictures. 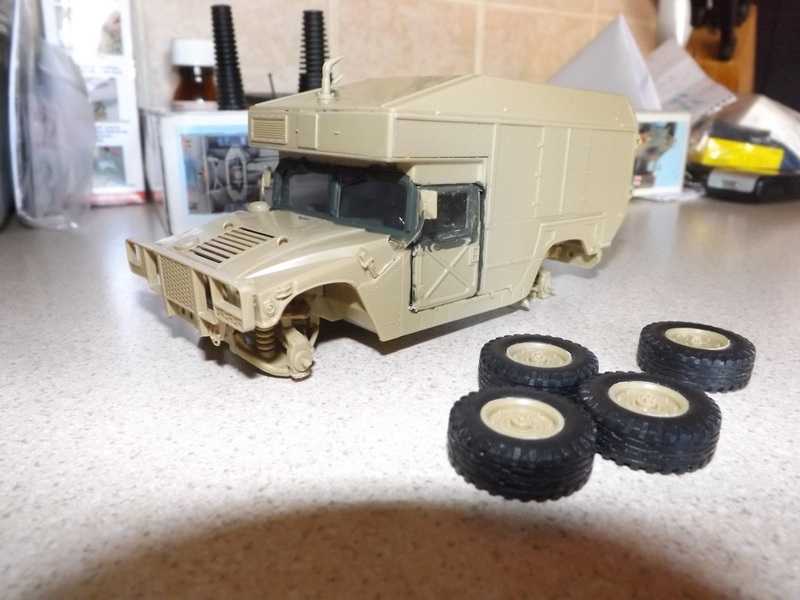 The 3 pictures below, are of a vehicle that i've had in mind to build for quite a while, in fact, up until now, i still don't even know what it's called. 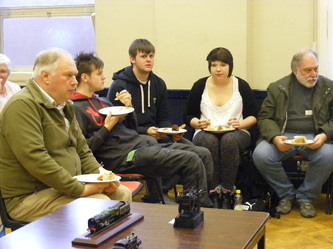 The only information i have is a photograph, kindly given to me by Ian Sadler, which started the project off. 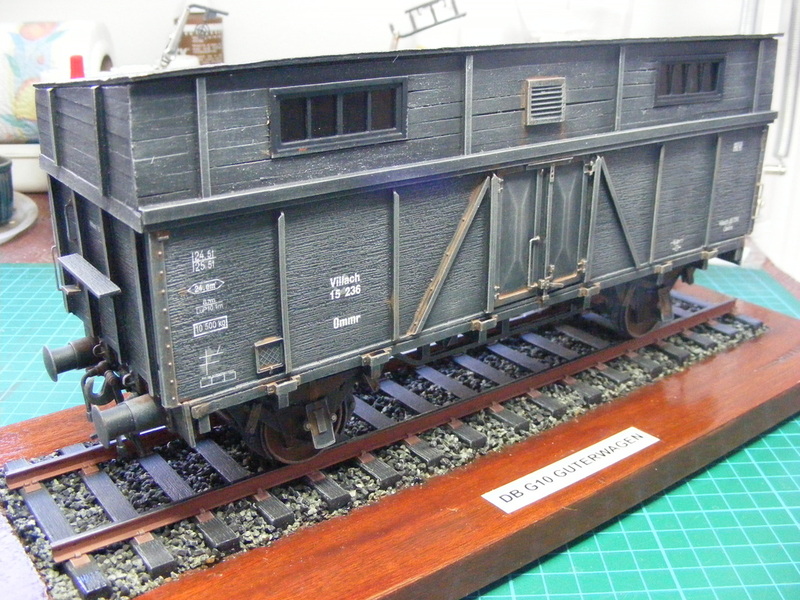 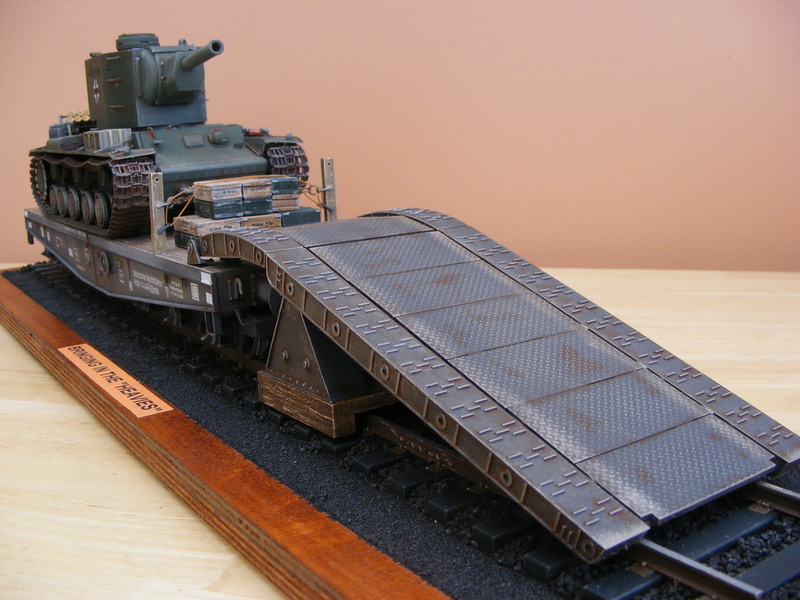 It's german freight waggon, that was used during WWll, and was converted to accommodate, in overhead bunks, personnel that were assigned to man the very large guns as they were transported to where they were needed most. 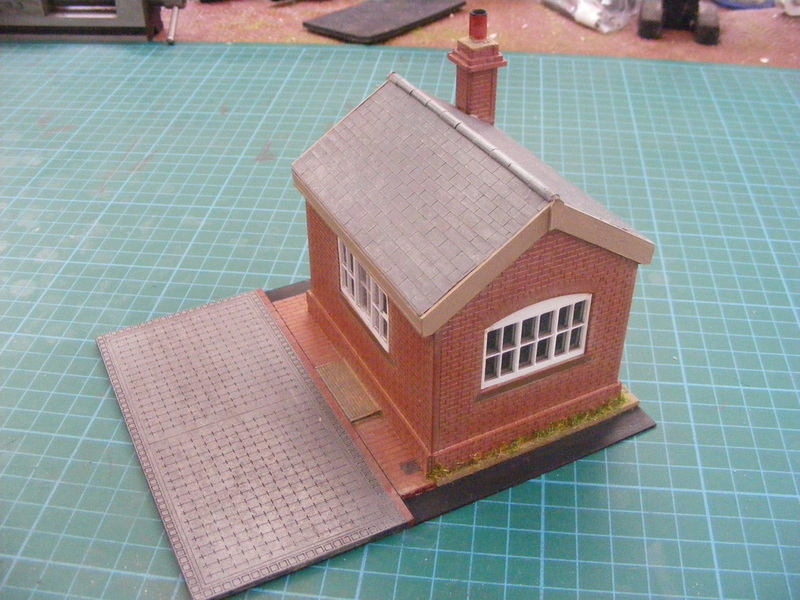 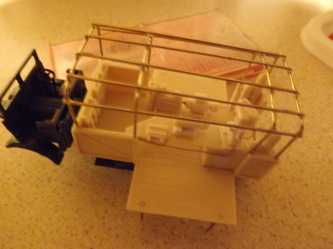 The pictures show it in undercoat colour, and the roof still needs to be made and fitted, together with the glazing. At the moment, i'm trying to find out what colour it was, it could have been in panzer grey, or a shade of brown, or a shade of green. 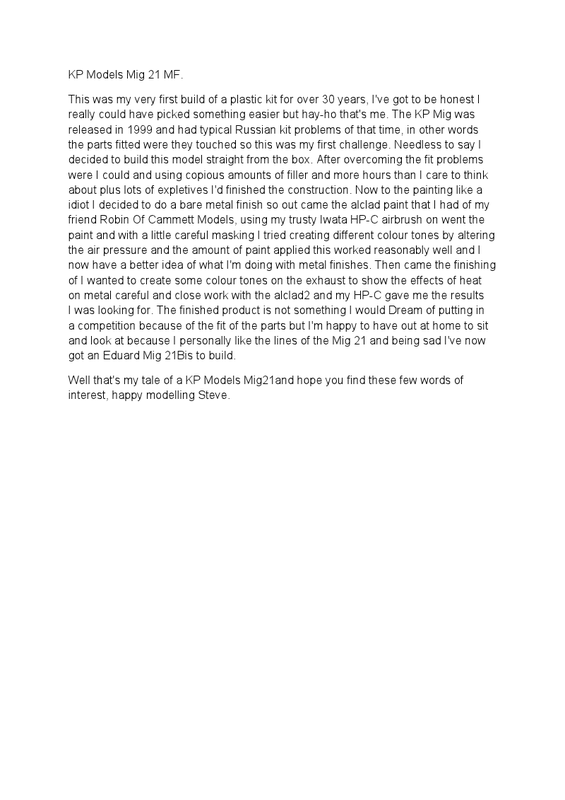 Hopefully, the information i get will reveal what colour it should be. 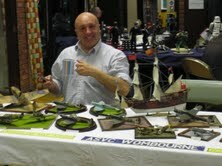 My word he has been busy!! 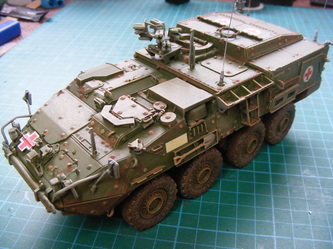 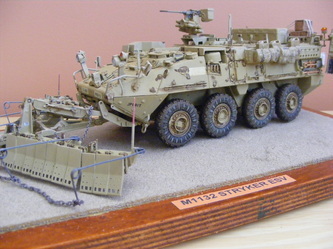 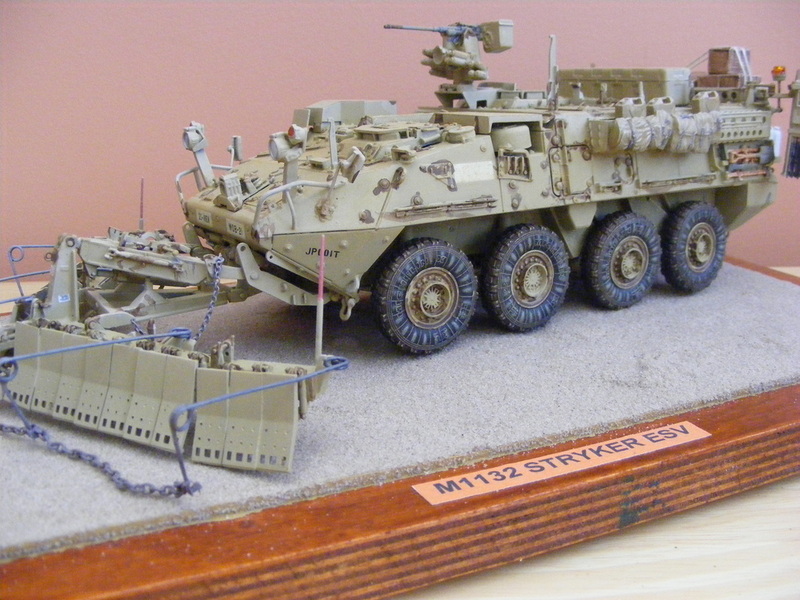 M1133 Stryker MEV vehicle. 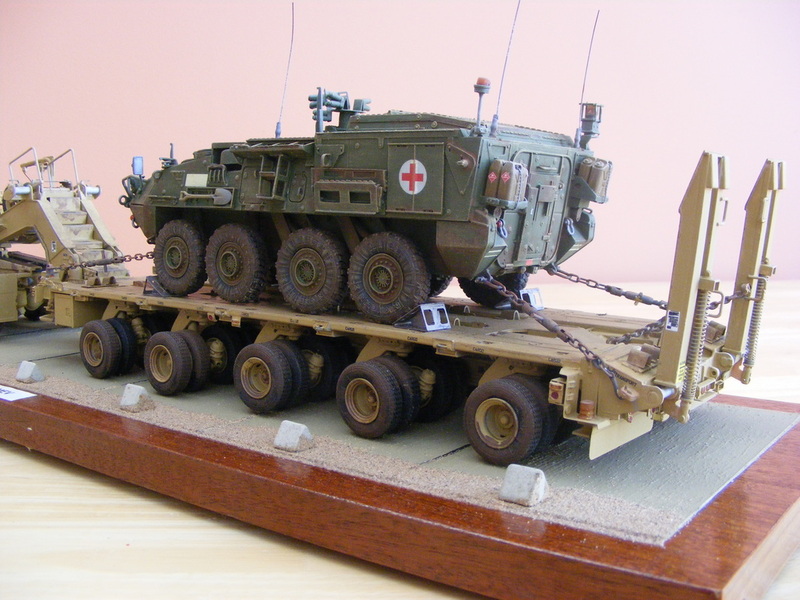 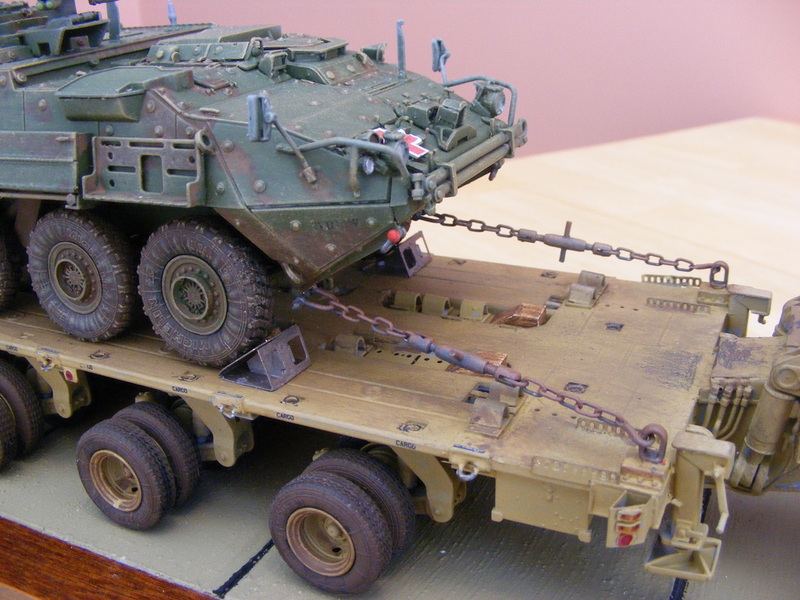 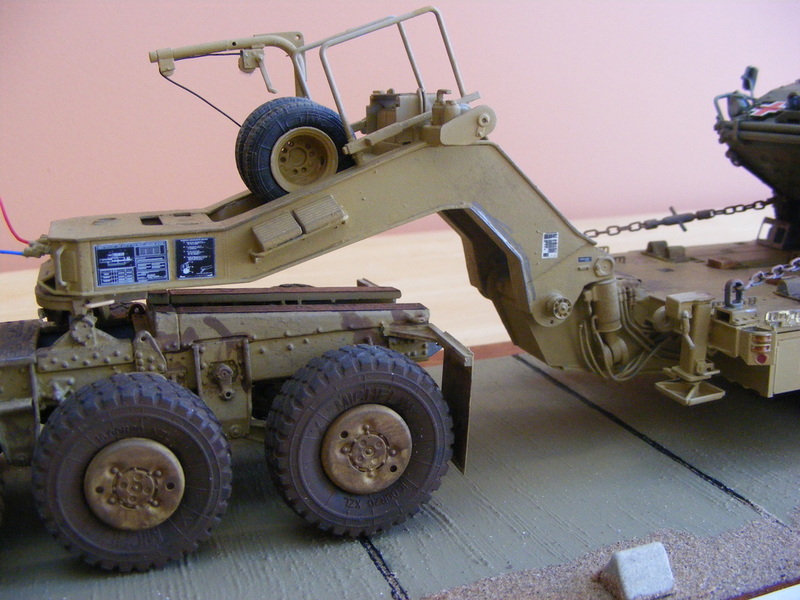 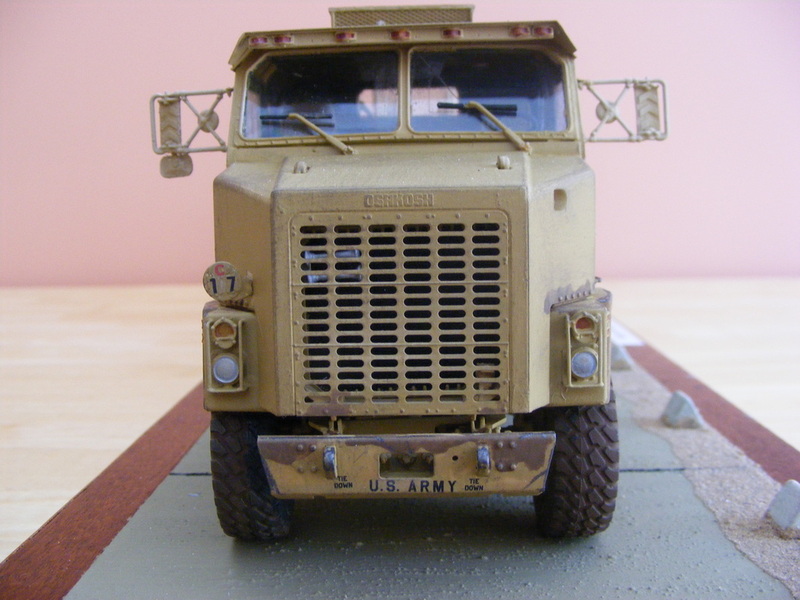 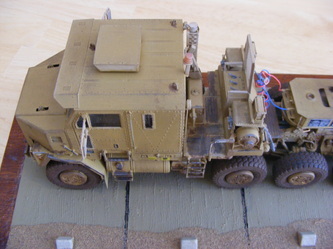 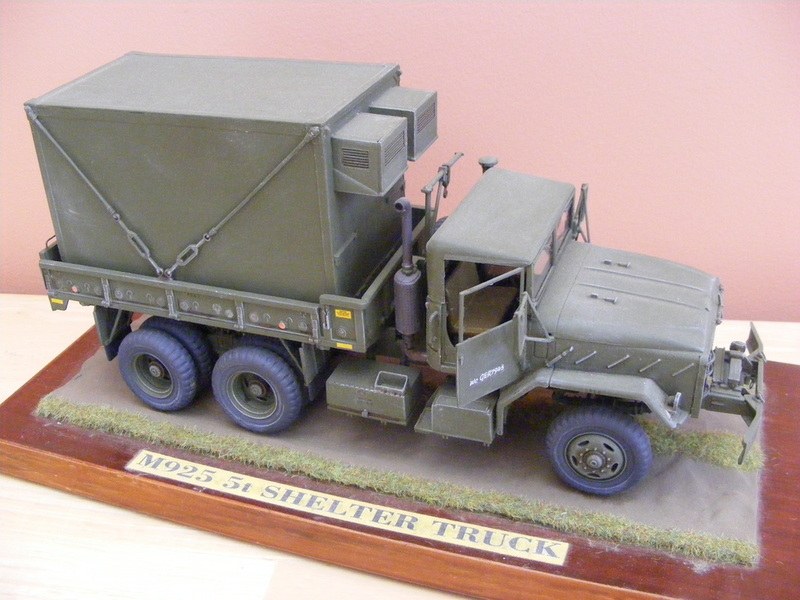 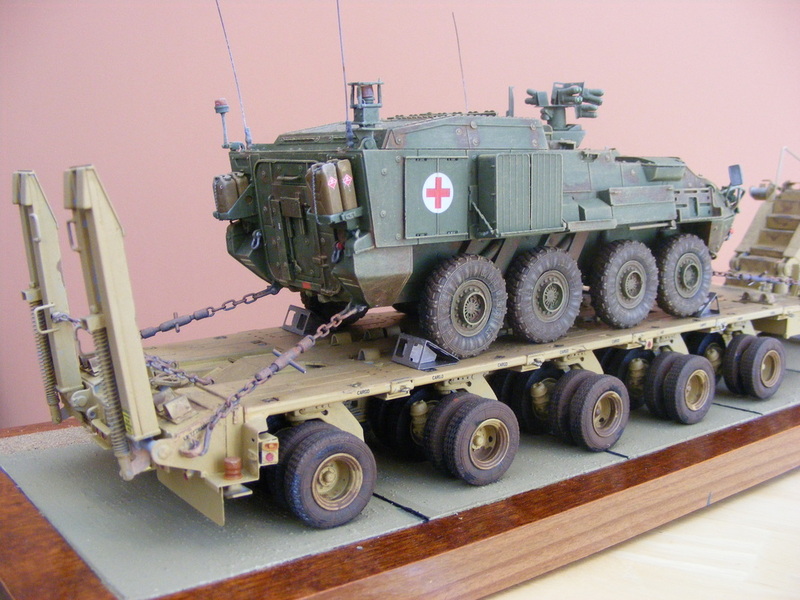 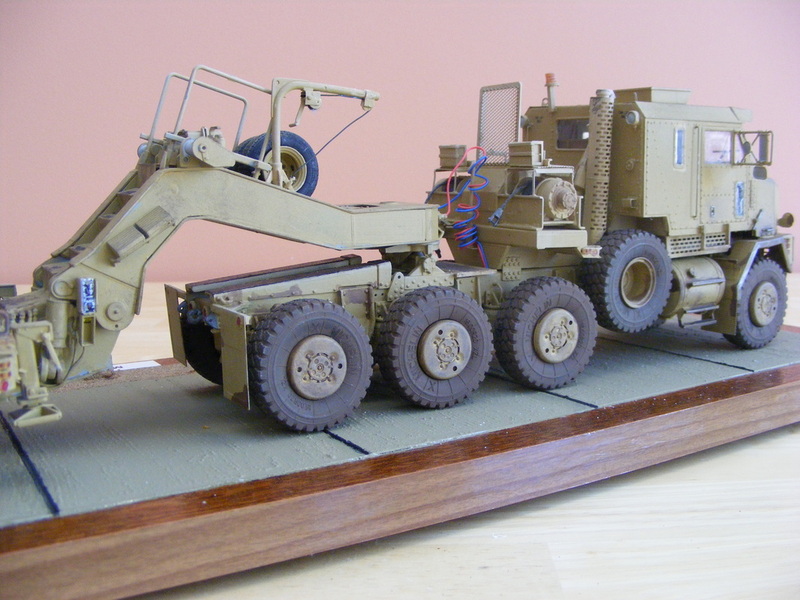 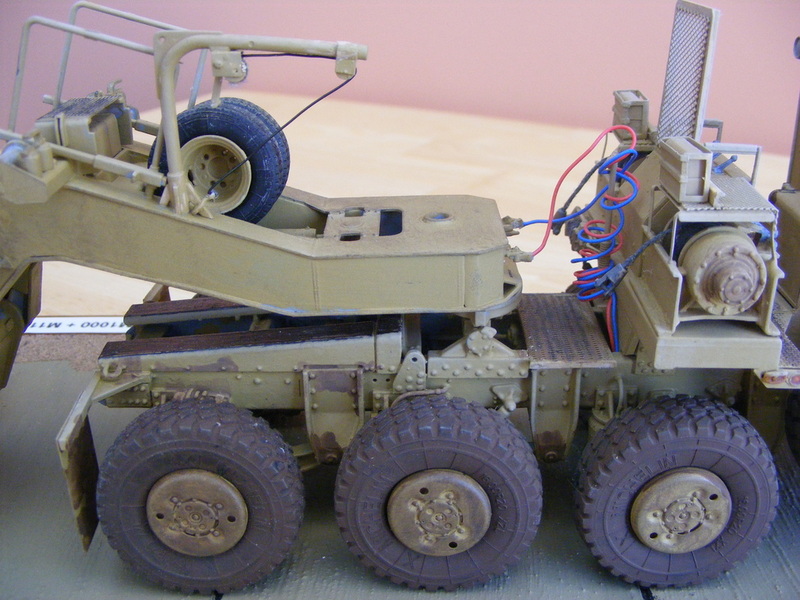 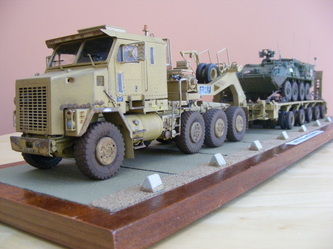 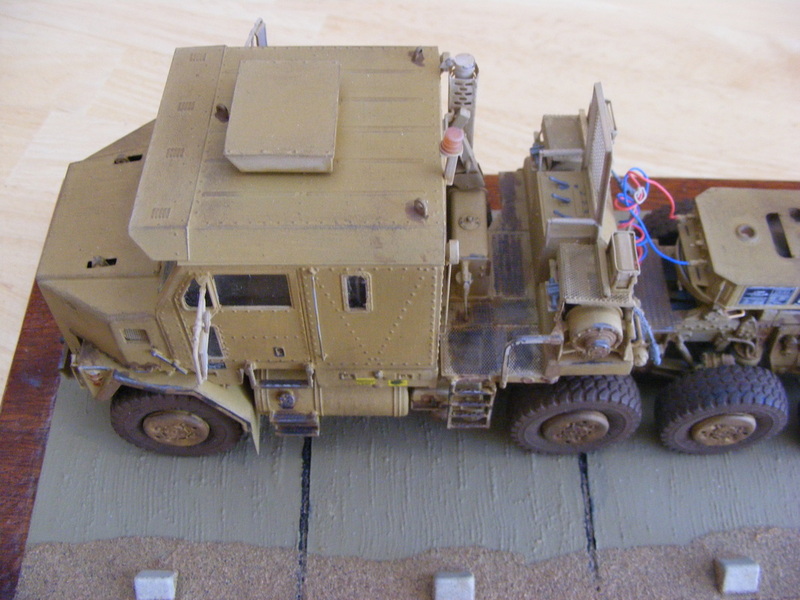 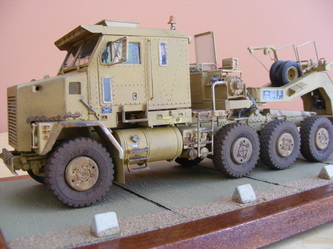 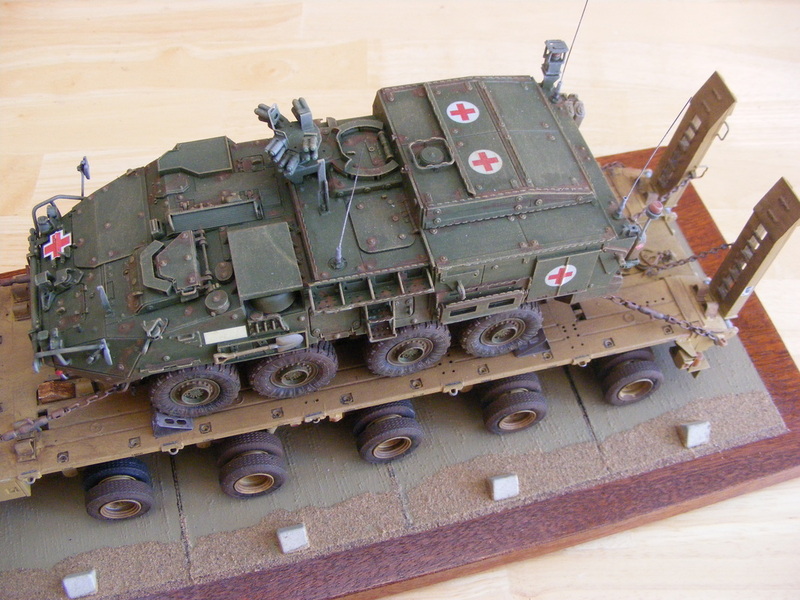 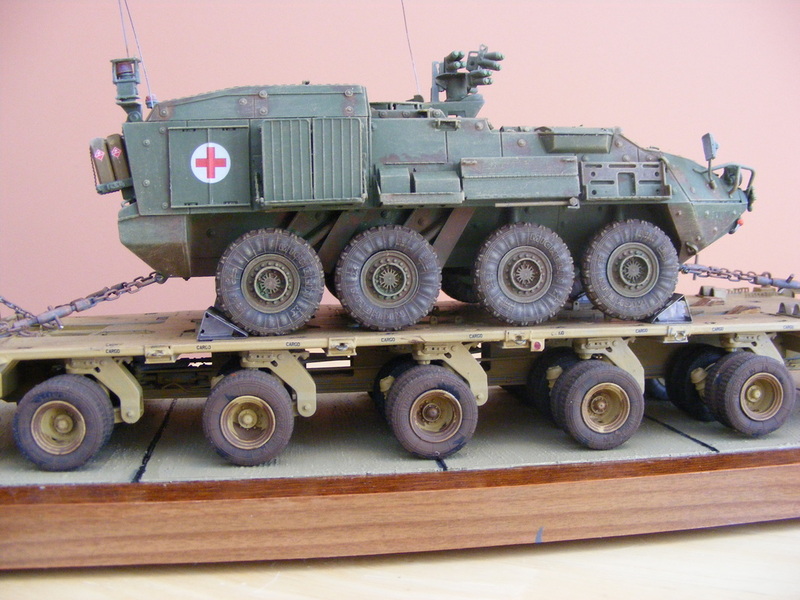 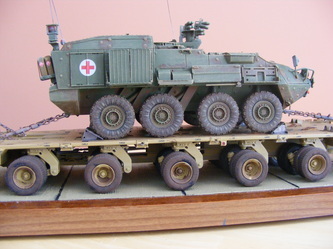 Widely known as a Medivac, (Medical Evacuation Vehicle), this model will eventually sit, chained down, on the flatbed of the M1000 heavy equipment transport trailer, which in turn will be coupled to the M1070 tractor unit, (Oshkosh) for short. 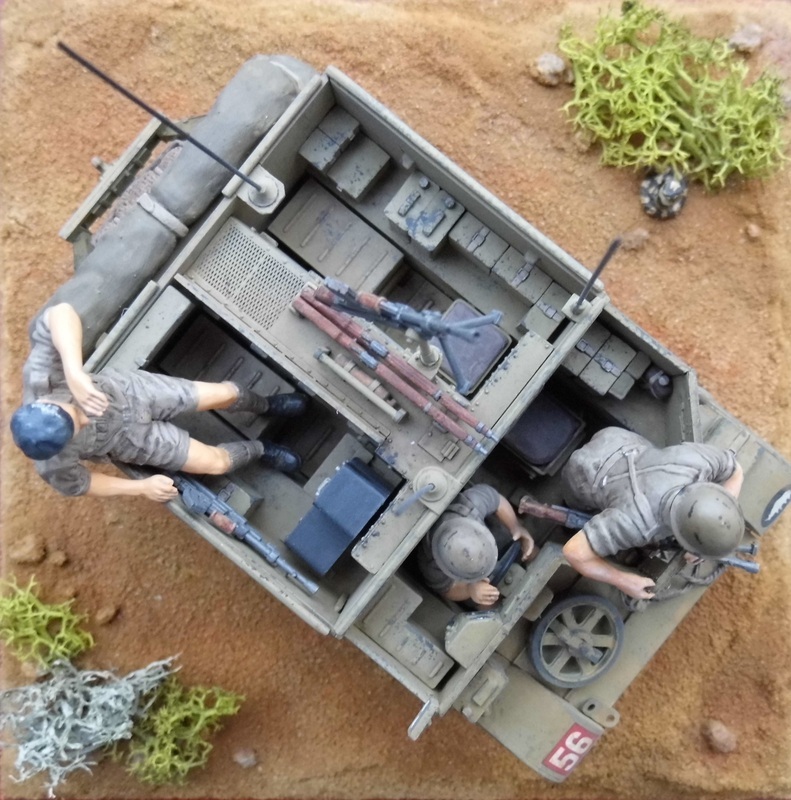 This mammoth project is currently under construction, and hopefully, i will publish pictures of the whole unit when completed. 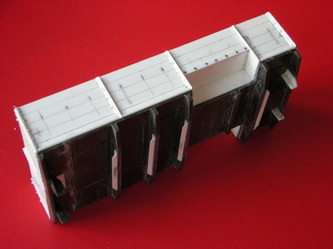 (Not too long as it happens)!!! 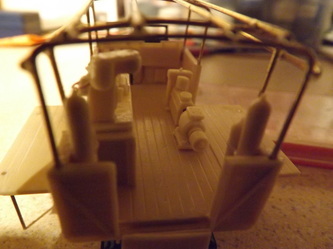 I'm getting there. 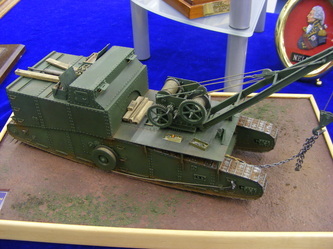 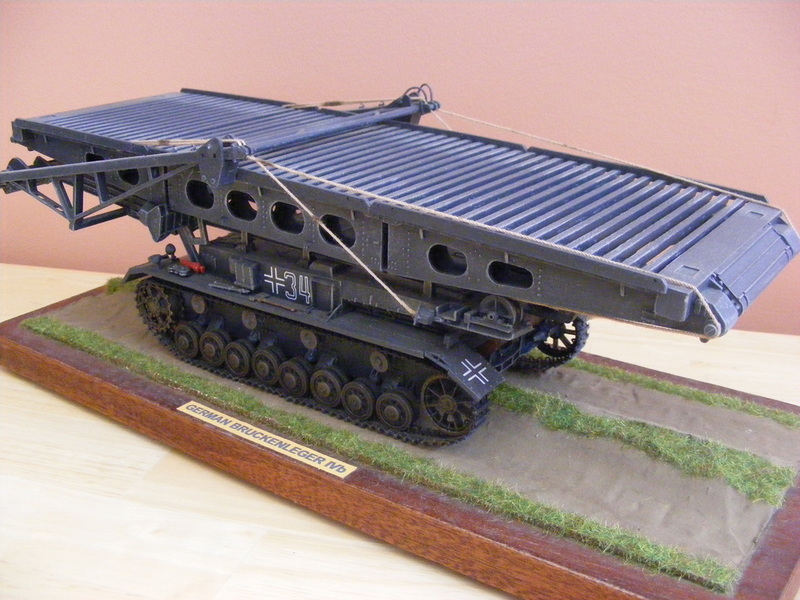 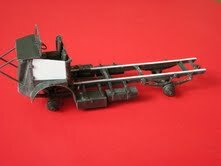 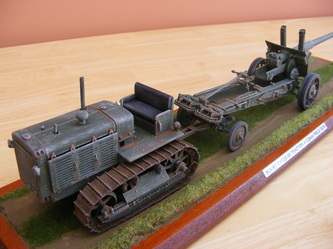 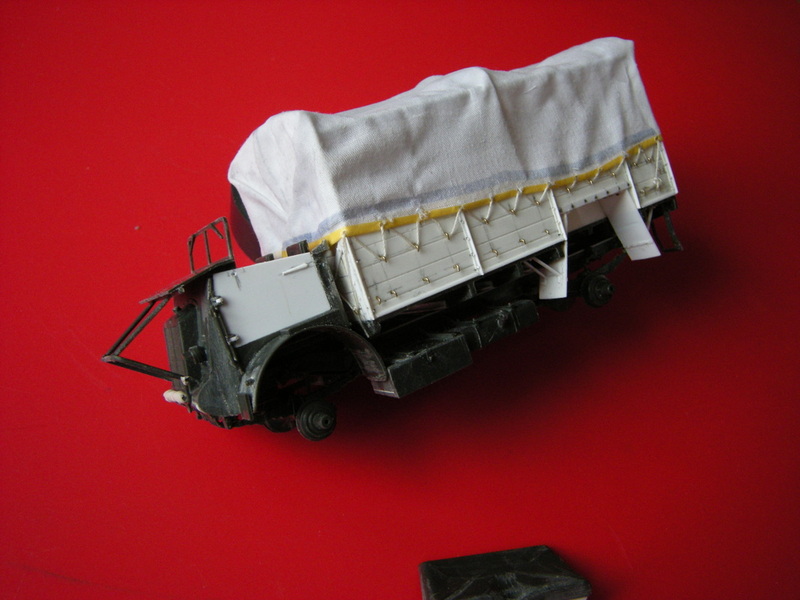 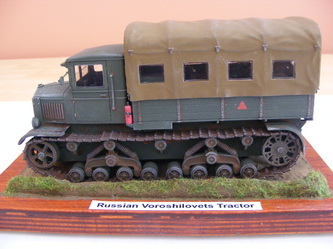 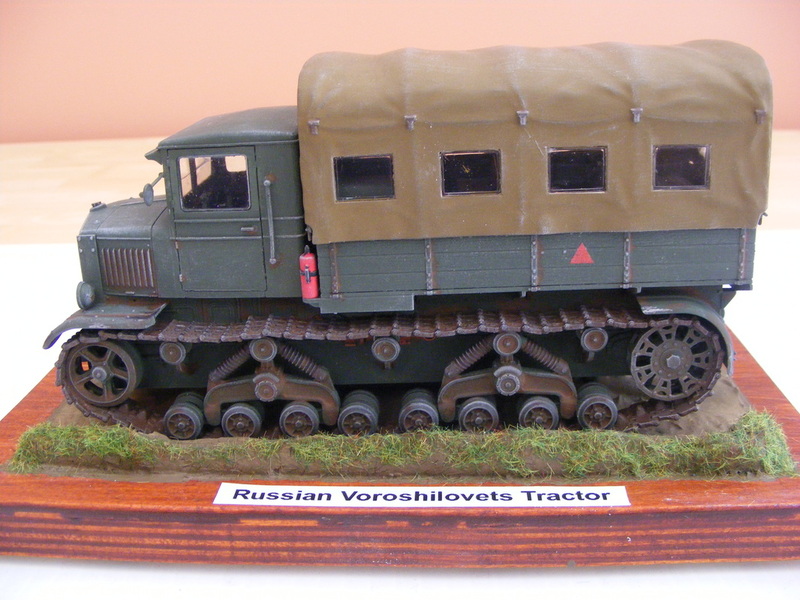 The following 2 views are of Trumpeter's "Soviet Voroshilovets Tractor". 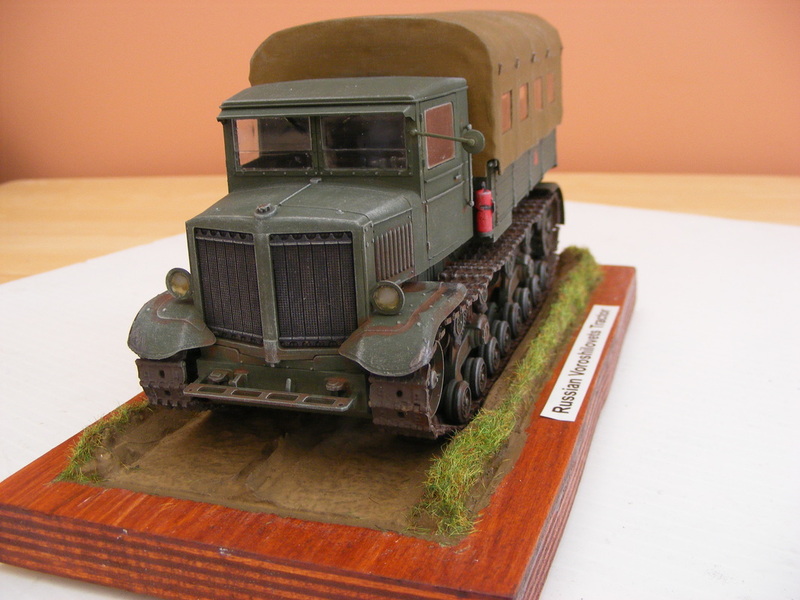 The vehicle was important as a prime mover from 1935 onwards, and was usually used to tow heavy ordanance, such as the 152mm howitzer. The suspension was based on the T-12 tank, and after the German invasion of 1941, production was moved to the Stalingrad Tractor Factory. 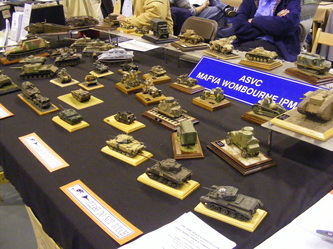 About 230 of this mark were eventually produced. 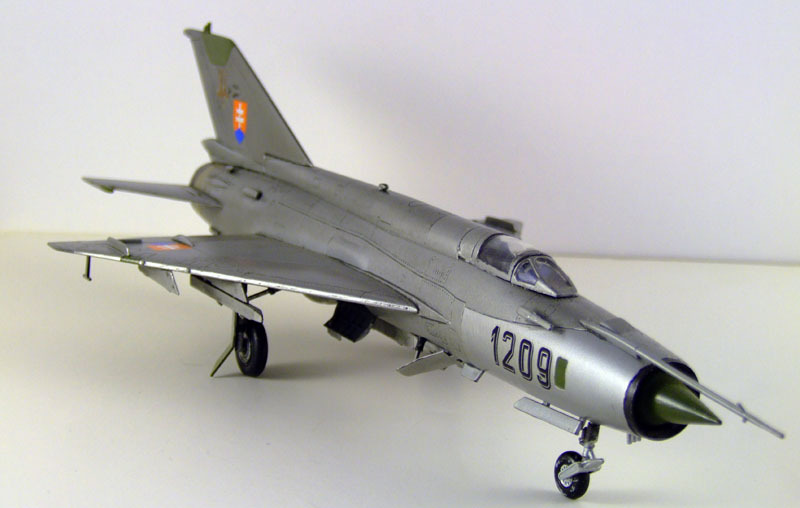 MIG 21 MF from KP Models, together with Steve's own description of the trials and tribulations of building a Russian kit from the late 1990's. 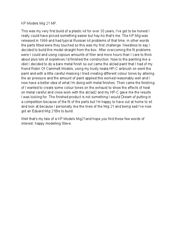 "The expletives have been left out" he tell's me"??? 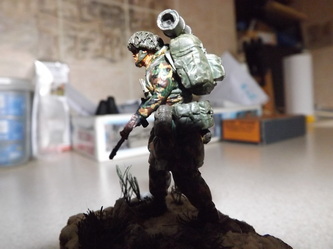 paints, and an Iwata HP-c airbrush. He also told me that it took about 30 hours to complete. 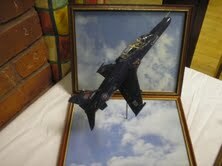 Really, i find that hard to believe, i bet in reality he built it like lightning!!! 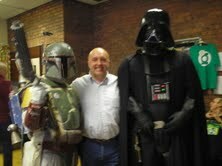 Err, sorry about that folks!! Very nice Steve, hope to see more of your work. 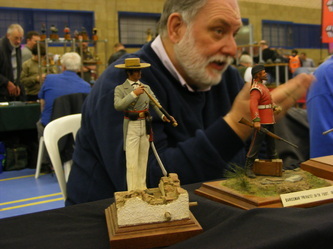 "Two models I really liked, and very nice they were too.